El Best Western Saranac Lake se encuentra en el centro de Saranac Lake. Venga y disfrute de las mejores atracciónes turísticas cerca de nuestro hotel. Precios bajos garantizados y ofertas exclusivas. Este confortable hotel de Saranac Lake garantiza a los huéspedes una fantástica ubicación a sólo unos pasos o a poca distancia en auto de numerosas atracciones o lugares de obligada visita. Los hoteles de Saranac Lake cuentan con una de las mejores ubicaciones del estado de Nueva York. Nuestro hotel ofrece unas fantásticas vistas a la montañas Adirondack y las actividades de geocaching son uno de los principales pasatiempos de los visitantes. ¿Qué le perecería aprovechar la comodidad de nuestro hotel situado junto al Lago Saranac y disfrutar de una fantástica combinación de lujosas instalaciones al mejor precio?Desafortunadamente, no todos los hoteles de Saranac Lake están cortados por el mismo patrón. Nuestro establecimiento cuenta con la única piscina cubierta de Saranac Lake, así que, independientemente de la época del año, podrá disfrutar de un baño siempre que lo desee. La proximidad al Lago Placid y las instalaciones olímpicas son sólo parte de nuestro atractivo. También nos encontramos a poca distancia de restaurantes, alquiler de barcos y recorridos guiados. La mayoría de los huéspedes escogen nuestro hotel de Saranac Lake para entrar en contacto con la naturaleza. La impresionante caída de la hoja en otoño y las actividades de senderismo, golf y recorridos en moto de nieve le permitirán disfrutar de unas experiencias totalmente nuevas. Pase el día practicando sus habilidades con la fotografía. Realice un recorrido de senderismo y respire el aire puro de la montaña. Aumente sus niveles de adrenalina con un recorrido en moto de nieve con Jack Frost. Al estar situado a 13 kilómetros del centro de?Lake Placid, nuestro hotel de Saranac Lake puede ofrecer a los huéspedes unas tarifas muy asequibles. Muchos huéspedes en viaje de negocios han convertido nuestras habitaciones en su segundo hogar. Los empleados del centro médico Adirondack Medical Center, el colegio universitario Paul Smith's College, el aeropuerto regional Adirondack y de distintas sedes del gobierno estatal de Nueva York como la Policía Estatal, la DEC y la APA son otros de los huéspedes habituales de nuestro establecimiento. Nuestro hotel ofrece una gran variedad de lujosos servicios. Acceso gratuito a Internet Wi-Fi. Ejemplar gratuito de periódico en recepción todas las mañanas. Nuestro restaurante McKenzie's Grille está situado en el exterior del vestíbulo y sirve desayunos y almuerzos a unas tarifas muy asequibles entre las 7:00 y las 13:30 horas. Reserve su estancia en el BEST WESTERN Mountain Lake Inn y disfrute de un hermoso entorno durante su próximo viaje. Se admiten mascotas solamente en habitaciones designadas a tal efecto en la descripción. Si no hay ninguna habitación de este tipo disponible, no se permitirá la presencia de mascotas en esa fecha. Haga clic en el apartado de información del hotel para consultar las políticas de alojamiento con mascotas. Disfrute de su estancia en nuestro hotel. For the price we paid for this place it could have been a lot better. The person at the front desk was extremely rude, acted as if we were bothering him when we inquired about a room The room was smelly and not very clean. I was treated like family in the sense that I was traveling from home and my stay here was much like home. I actually had more rest here than I would at home. I requested a quite room and I they gave me what asked for. "Comfortable room and great staff"
The Best Western is located right a the lake, but off the main street, so it's quiet. Our room was well-kept, spacious and very comfortable. Front-desk staff were very helpful and accommodating. And the restaurant on the premises serves a great breakfast. We've stayed here before, and will be back. My husband and I are snowmobilers and visit the ADK many times a year. This year we wanted to snowmobile around the lake placid and Saranac area. Presidents Day weekend is insanely busy in that area. We made this decision kindve late in the game and when I started calling the area there was no vacancy! I called so many hotels and air bnbs and couldn't find anything. The main issue was that we have a dog so I was calling all the dog friendly hotels which limited our choices even more, although the ADK region is extremely dog friendly compared to others. I gave up and figured we wouldn't be going anymore. The next day I tried one more...The Best Western in Saranac, which we've passed many of times but forgot about it. Well, let me say, Kevin at the front desk was probably the most accommodating hotel interaction I've ever had!! I told him about our puppy and how long we would be there. He said “give me a minute” I'll make this work! He found us one of their dog friendly rooms that was right near the back door so we could take him outside easily. He gave us a cheaper price than AAA and only charged us 1 Day pet fee. I was so happy!! We arrived and were so pleasantly surprised by the updated decor (we've stayed at Best western in Lake Placid and while the view can't be beat, they need a major over haul, place is getting run down). The rooms were clean, spacious and the staff was so friendly!!! Their indooor pool was so clean and spa like. They even left it open a little longer for us. We went to breakfast every morning at Mackenzies grill right out front, (you can walk to it, it shares the same parking lot) where you get a discount with your hotel stay. 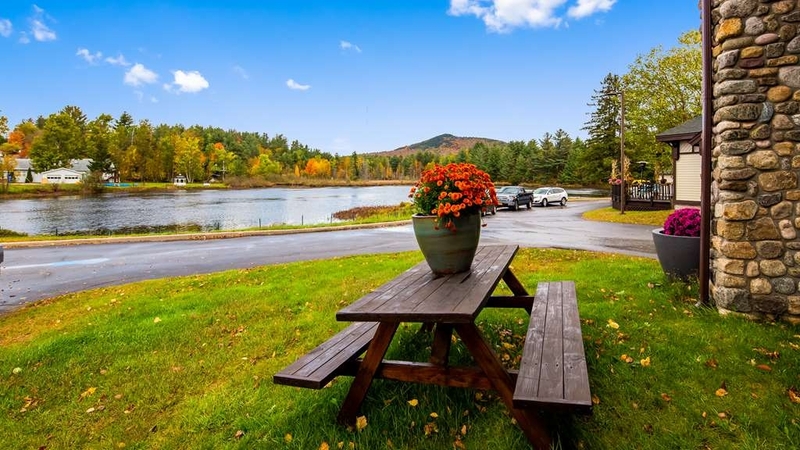 Cozy ADK vibe as you stare across the stree at Lake Flower. The snowmobile trail is directly behind the hotel do we were able to jump on and ride off into the wintry abiss. They also allowed to park our sled trailer in the lot, how nice! I highly recommended this place for comfort, price and convenience to the area. We were treated wonderfully! Can't say anything but good things! Thank you Best Western of Saranac Lake! We stayed at Best Western Saranac Lake for our son's hockey tournament in January. 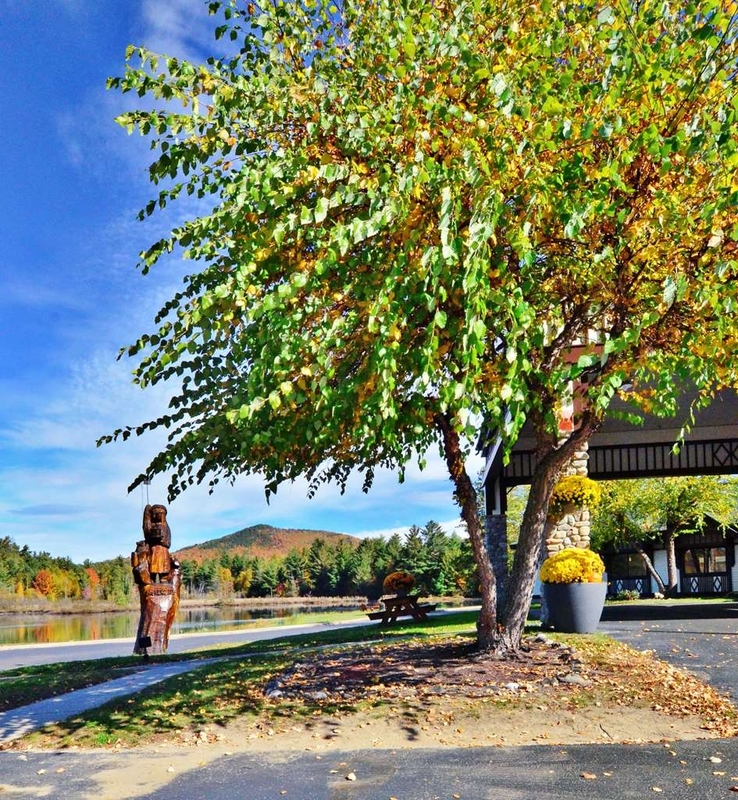 Staff was very helpful, our room was clean and comfortable and the location was perfect - very close to Lake Placid. We enjoyed our stay. "The place to stay in Saranac Lake"
My, husband just spent three nights at the Best Western Saranac Lake. Our usual experience in our stays there has not changed. It's very clean, it's comfortable, the staff (desk, housekeeping, and maintenance) are extremely friendly, and it's a good value for the price. "Ice Castle Weekend in Feb"
We stayed here for the ice castle beginning weekend this year. Turned out that we had eight people for this trip. Everyone was pleased with their rooms and the staff was great. Check in was quick and easy. The indoor pool was nice after being out in the very cold snowy weather this year. Beds were very nice and plenty of towels. The only problem was the lack of an elevator to get to the second floor. Breakfast and lunch was available at the McKenzies grill on the property and offer a discount for those staying at the hotel which was nice . "Winter in the North County"
I was traveling with another businss associate. We would stay at this hotel again. A winter night in the North County, staff was helpful and a great shower! Hope the same staff is on hand next visit to the area. motel was ok cleanness is good and rooms are standard,but the view around the area is beautiful. heard if you go in Feb the ice castle is amazing. the mountains in the vicinity are beautiful. need to experience this area. The Best Western staff could not have been more polite or more helpful, It was a great place for the price, with a good breakfast next door and close to a lot of what the Saranac Lake area has to offer. "I didn't have many choices"
I stayed at this hotel in January of 2018 for business. I was disappointed because the hotel did not seem clean. I was there for a week so I felt quite uncomfortable. The front desk wasn't always covered so you were on your own if you needed anything. 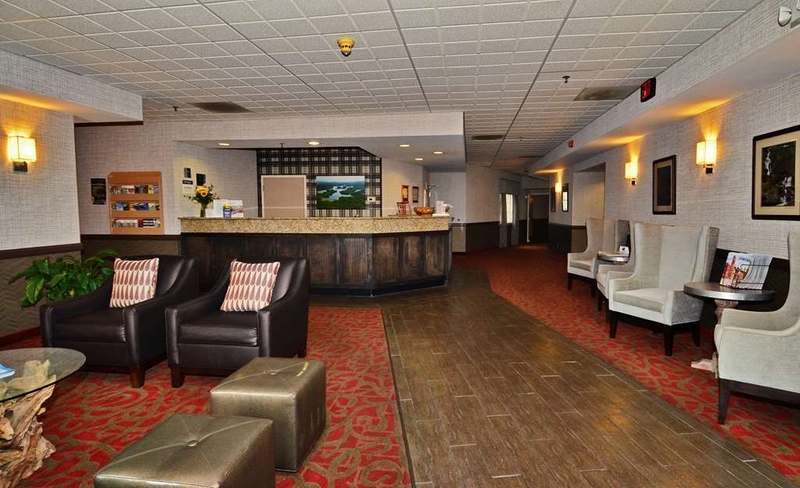 The Best Western in Saranac Lake, NY is a Great place to stay in the Adirondack's. We pulled up the entrance was cleared of snow. Check in was quick and easy. The room we stayed in was very clean and very roomy. They have a restaurant on site, the food is great. I have nothing bad to say about this Best Western. There are 6 hikes in the area and this hotel is central to them all. Plus it's close to a quaint downtown with coffee shops & book stores. Bustling in the summer, fall sees a different crowd. Close enough to Lake Placid but without the high prices! Overall a very good experience. Many Best Westerns have continental breakfast. Not this one. Only other complaint is the restaurant next door is only open until 2 PM. It is excellent for food and takes discounts from the hotel. We enjoyed our two day stay at this property. The service was efficient and the staff pleasant. Rooms are large and clean and the beds are most compfortable. The hotel is well located and close to many restaurants and activities. The view of Flower Lake and the mountains with the fall colors was lovely. I definitely recommend this hotel. Good quality / price value. "Awesome staff! Awesome price! Awesome stay!" The staff is very friendly and efficient. The apples were delicious. Rooms were very clean. Love the washers and dryers for our clothing. Overall everyting was great. Will always stay at BW. The location is perfect for our purpose of visiting saranac. McKenzie grill is also great! "You won't go wrong staying here..."
The last location on our 2,600 mile road trip was great. The room (even though it was an inside cabin) was quiet, decent size and clean. There is an undercurrent of professionalism with the front desk staff that exudes confidence. Their recommendations of restaurants and attractions was a bonus. We were supposed to go to Myrtle Beach, but Hurricane Florence changed are plans. Called at the last minute and they had a room. Very clean very comfortable beds. Great having McKenzies next door for a dollar value breakfast. Very quite very easy to drive over to Lake Placid. Do not miss a chance to stay here. Clean and comfortable. The staff was friendly. The view from the room was beautiful. Would recommend. 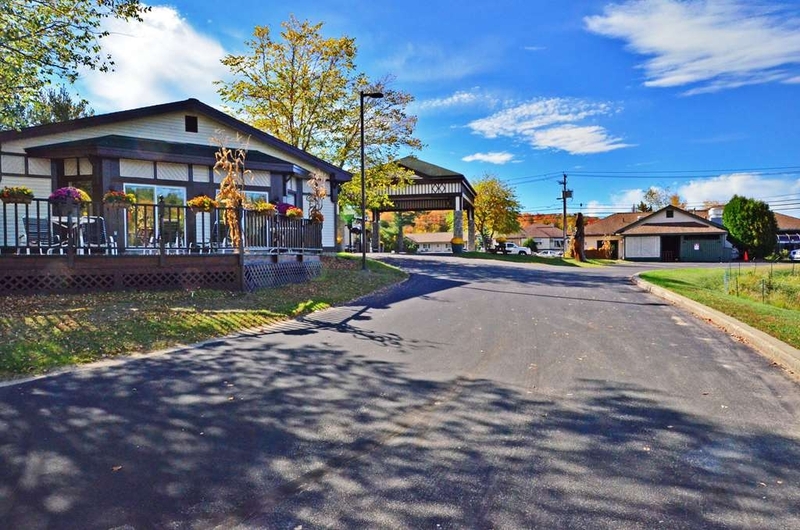 Close to downtown Saranac Lake, 4 min drive to everything downtown. My husband and I were very satisfied. 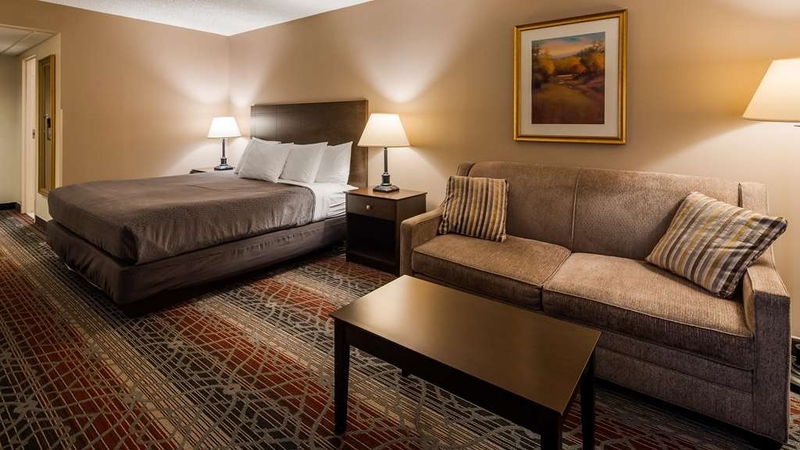 "Pet friendly and outstanding staff"
The hotel was clean, the bed was wonderfully comfy, and our suite had a 4k tv. The adjacent restaurant was wonderful, and you could stroll in and get free coffee if you showed your key card. You received 10% off your bill if you were staying at the hotel, and coffee was also free when you dined. Great stay. Rooms a touch dated but beds very comfy. Close to a number of restaurants and bars. Staff were very helpful and knowledgeable about the area. No elevator but they can accommodate everyone on the main floor. The Best Western in Saranac Lake was able to take us in for a last minute vacation. This hotel was clean, attractive, and had the things we needed to make our stay pleasant. It was not a 5 star hotel, but that was not what we needed, This place was reasonable for what we wanted. Last stop of our vacation and it was perfect. Arrived two hours early but were allowed to check in. The person at reception desk were gracious and accommodating, we were in our room in less than 10 minutes. He also recommended a great restaurant for my husband's birthday dinner and even drew us a map to get there. Is this kind of service that makes us come back to Best Western hotels. The Saranac Lake Best Western was clean, convenient, and quiet. We had no issues with the hotel however there was nothing about the hotel that made it stand out. The accomodations in the summer on a weekend were $216 which we thought were a bit pricey given the fact that the hotel did not offer anything special or complimentary. This is a very nice hotel. Priced right, with clean spacious room. The room was clean, as was all common areas and pool. Only reason 4 stars and not 5 was that beds were smaller than indicated (full and not queen size). I would stay here again and recommend this hotel. "In the area, STAY at BW!" "Not on the favorites list"
We booked for a weekend and it did the job but it is very basic. Room was musty, the lightbulb in the bathroom was continuously flickering and the only time we could use Wi-Fi was before 6:30AM. So if in a pinch and they have a sale, yeah, it's ok.
We contacted the hotel at about 4:30pm looking for rooms for a group of approx. 10 scouts and were very lucky when we reached the night manager at the Best Western. The forecast called for pouring rain and we were trying to keep our heads dry before setting out on a 4 day canoe trip, Dave was sympathetic with our situation and got us settled at a price that fit within our trip budget. The hotel is located next to a lake and was perfectly comfortable for the night. "Be careful making on-line reservation....Sarance lake BW will not accomodate changes!!" We made reservation on the BW website and had to make a departure change...all within the proper time guidelines to make changes. We contacted customer support to make the change and they said they could not...they recommended we contact the Saranac Lake Managerment who we were assured would be able to make the change. Sarance Lake BW was not interested in helping or at least providing a discount. We had to leave early and wasted 192$ on a night we could'nt stay for. The Saranac BW blamed the on-line Reservation Website for the inaccurate information and direction. "Great location, okay room, clunky wifi"
The stay here was good, except for the wifi. I had to continually reconnect my phone every few minutes.My laptop held on to the signal but I had to manually go through a screen every time I connected; it would not reconnect automatically. It should not be like this. Bill on the front desk was super. The breakfast place in front was convenient and very good. We had an Awesome experience at the BW Saranac and will definitely be back. The Hotel as a whole was Very clean as was our room. The staff was friendly and helpful from start to finish. I would recommend this hotel to anyone staying in the Saranac Lake region. "Very expensive and not at all worth it"
"Best Hotel in Saranac Lake"
We stay at the Best Western Saranac Lake frequently and always enjoy our stay. The hotel consistently exceeds our expectations and the staff is great! We always look forward to a great breakfast at the on site restaurant. Stayed for 3 nites with parents. Comfortable beds, clean room, loved the walk in shower. Next to very good restaurant for breakfast/lunch. Only complaint would be the chlorine smell in pool area was very strong, however, that means they take care of it and it was a nice indoor pool. 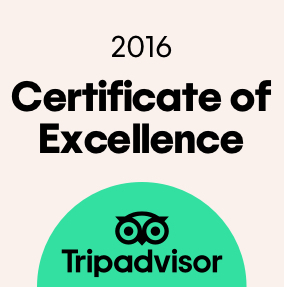 Overall good value and would recommend and stay there on future trips. 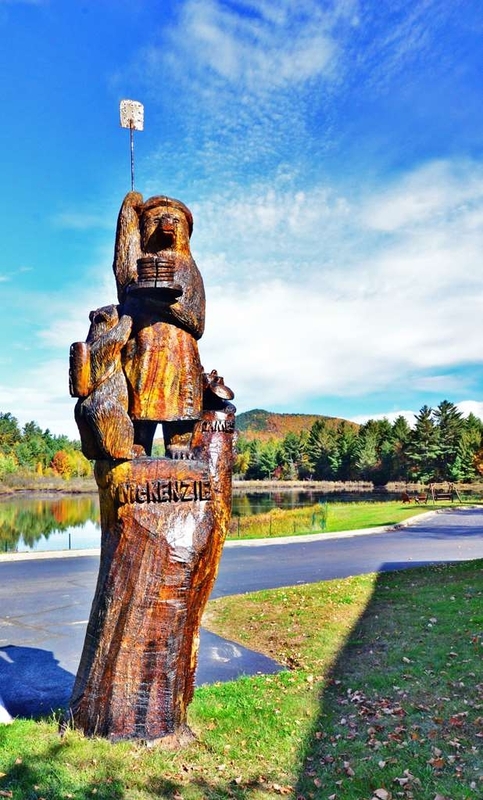 "Gem in the lakes region"
This is a shining gem. 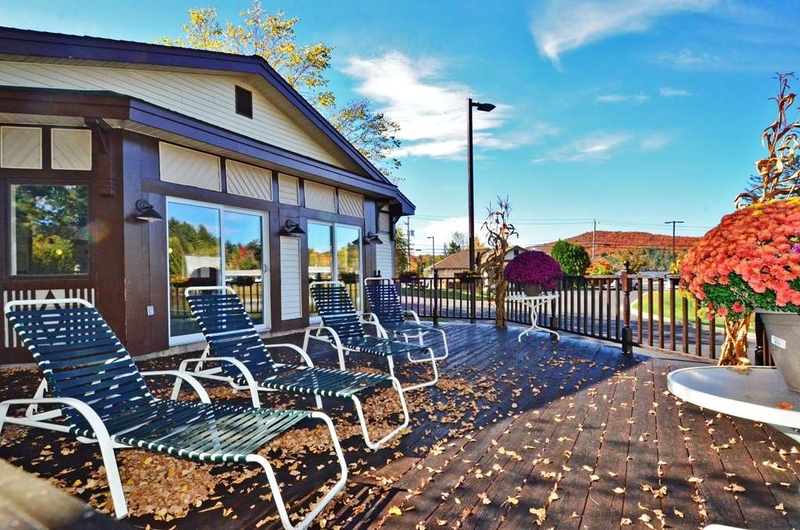 The look, the staff, the price, and the amenities make this the place to stay while in saranac lake. Never a problem and a super courteous desk staff help you to feel relaxed yet full of energy for exploring the beautiful surroundings. Whether you paddle, hike or just rest, this is the best choice in the area. This hotel had a good location with a few restaurants nearby. No free breakfast but they did give a voucher for a free breakfast at a restaurant onsite. Also a 10% discount on any other breakfast or lunch ( Didn't serve dinner) Hotel was clean and well kept. Really liked the covered motorcycle parking for our trike. Located in a very pretty setting, right off the main road. Very friendly staff. Nice rooms and pool. Within walking distance to main area of town. Only minor drawback is no free breakfast, but small restaurant next door has very tasty breakfast and offers a discount with room key. Would absolutely stay here again. "Very friendly staff and comfortable rooms"
We have been repeat guests at this hotel for a reason: It's got an indoor pool, it's easily accessible, quiet and with very friendly and helpful staff. The rooms are comfortable and spacious. My only minor complaint is the shower setup needs improvement. The lip of the "tub" is too low and it floods like crazy. Apart from that, it's an easy walk to the Mexican place next door for food and drink as well as a breakfast place. Reliable, clean and accessible. Very pleasant desk personnel; clean and pleasant room with adequate heating and cooling system. Good restaurants near-by and a lovely view of a man-made pond. Very pleasant town and a good place to visit for a nice walk on some of the Adirondack trails. "Fine place to stay - good traveling with dogs!" We ended up picking this hotel because they allow more than one dog (without a size limit and with a low per night fee). It met our needs. It was clean, with a small fridge, and I think there was a little microwave. It wasn't deluxe accommodations but, it was affordable, accessible, and pet-friendly. If you ARE traveling with a dog, be sure to book one of the limited number of pet-friendly rooms. Hotel is a older hotel,Beds were ok. Bathroom very tight. Door almost hit the toilet..The bathroom vanity was very low. I'm short & it was low for me.. There was no breakfast , a restaurant next store,u get 10% discount,it was good... Hotel was clean,staff was nice..
"Very nice, but with reservations"
We were very pleased with this hotel and the room overall. The spacious room was great for all of our gear, and everything in the room worked properly (including the WiFi). Our only issue involved the process of asking for a late checkout on our departure day. We tried to ask in advance using Best Western's email request process, and were told we had to ask on the morning of our departure. We wanted the late checkout, however, because we were going to be out in the wilderness from 5 a.m. to about noon, getting us back to the room about 12:30 (checkout is normally noon). We asked at the desk the night before and explained all this, and the night manager told us to call in the a.m. We were in a wilderness area with no cell service, however. In the end, we finally got ahold of the desk at 11:55 a.m. on our departure day, and were told if we were not out by 1:00, we would be charged for a whole extra day! This experience really soured us on this hotel, causing stress that seemed entirely unnecessary. the service was excellent. the room was clean. the bathroom was ok , only problem was the door has to be closed to use shower and toilet because door almost hits toilet. the bed was very comfortable and roomy. nice restaurant next door only serves breakfast and lunch gives 10% off with room key. average price for room. we only stayed for 2 nights. visited Lake placid , the wild center and Whiteface Mt. Stayed at this location after picking my son up from college. The room was clean. The staff was friendly and accommodated my request to be in the back, away from the road. My only complaint was the bed which was extremely hard and caved in in the middle. Other than that everything was fine. Very nice hotel, friendly staff at check in and check out.nice and clean and fresh smelled. There was no breakfast but the had suggested a convenient place next door. Older building but very well maintain. Needs better beds/pillows. Bathroom needs an exhaust fan. Breakfast was good, prices a little high. Staff very friendly. Pool area was nice and pool was nice. We would stay again. Please update the beds. We found the rooms to be very clean, well equipped and very comfortable. We stayed three nights and enjoyed out visit. The hotel provided us with discount coupons for the restaurant next door where we had excellent breakfasts each day. "Clean and convenient with uncomfortable beds"
The rooms and lobby are clean and welcoming, and the discounted breakfast at the restaurant next door is above average. Easy check-in and check-out, and easy parking. 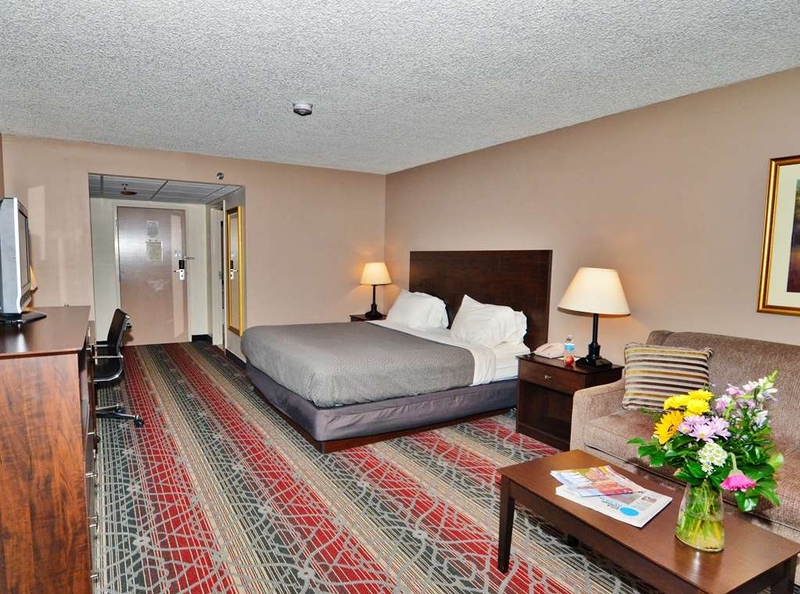 The AAA discount makes the room a good bargain overall. BUT: The beds were noteworthy for their discomfort: they cave in the middle and feel like plastic-covered-cardboard with some cotton balls thrown into the mix. Just really unpleasant for all three adults who stayed here. Enjoyed my stay and service was excellent. Employees were helpful. Easy in and out off main road and Breakfast at restraint was great. Rooms were clean and quiet. Did not get a chance to utilize the pool. "Walls So Thin You Hear Everything In Adjoining Rooms"
This would have been a one-star or two-star review were it not for management's willingness to "make things right" for us by charging us half of what we had expected to pay because of what we experienced. The hotel appears nice enough, and is certainly clean. The front desk staff were friendly and professional. The one major issue we had, and one that I expect could affect anyone, is that the people in the adjoining room were incredibly loud late at night, preventing us from sleeping. There were four adults sleeping in that room, and they were having a grand old time into the wee hours, while we wanted to sleep. When they were speaking in normal tones we could hear them as if we were in the room with them. When they got loud, or laughed loudly it was pretty much impossible to sleep. We contacted management and asked if they could quiet them down, and management did show up at their door. We heard the entire conversation, as well as the conversation that took place after the manager left. My recommendation to anyone considering staying here is to make sure you know who will be in the room adjoining yours if possible, and if that's not possible, try very hard to get a room with no one staying in the adjoining room. If you are unlucky enough to have strangers in the room that adjoins yours you are very likely to hear them. We will not stay at this property again. Older motel but very clean. Only complaint was that entrance B (pet entrance) had a lot of debris and the contractor did not clean up after himself. Lots of wood pieces laying around. Hard for pets to ignore and took away from the appearance of a hotel that is in a beautiful spot. Stayed here a third time while riding through the Saranac Lake area on a motorcycle tour with three other couples. The facility is clean and well maintained. We used a patio/deck area outside of an indoor pool for cocktails and relaxation after the day's ride. There is no breakfast included at this hotel but there is a very convenient restaurant that is a short walk that we went to for breakfast. Good breakfast. I will stay here again in the future. ""The woods are lovely, dark and deep------""
Arrived white-knuckled after a perilous journey thru some snow, but the front office greeted us with much warmth. Parking was easy and close to rooms. The room was large and very clean. Beds were comfortable with pretty good pillows. Their restaurant is out front, in a detached building, but an easy walk and well-worth it as the food was surprisingly delicious for breakfast. Hot food and good service We were here for a college tour and were glad we had made a decision to stay overnight and not try to rush back home..
"Two Days in Saranac Lake/Lake Placid"
We were here for a few nights for a wedding. Booked here as the other chain's full service hotels rates were really high that weekend. It was a more than acceptable stay! Room was warm and cozy and the staff were very nice. Glad there were eating options next door. Someone mentioned hockey teams making a ruckus, we did see some of the tykes but it didn't really bother us. We'll be happy to return in the future. "Quality Hotel - Great Value!" Reservation staff excellent, check-in "bumpy". Booked (2) rooms to meet Canadian friends, and "adjoining rooms" were promised; upon arrival, "not available - sorry" (appeared day staff had not paid attention to request). Upon room arrival, found several hairs in toilet and toilet paper spooled out, tub stained - bad first impression. But to be fair, we were an 'early arrival' and things got better: Aside from noted, hotel appeared exceptionally well maintained, beds comfortable, everything worked, quiet, and generally clean. Toiletry accessories were sparse (at least a minimal dish to put the soap in would be appreciated) but that may be an acceptable trade-off for the best part - this stay was an excellent value! Rate was nearly $100 cheaper than equivalent Lake Placid rooms just up the road, an "inconvenience" well-worthy of consideration. I would definitely stay here again and, as a 40-year business traveler, would recommend this hotel for business and vacation travelers! "Clearn but they discriminated against us and did not give us what we reserved for"
The room was really clean, but as a disabled person I had real needs and when we ask for something and we do not get it and pay the same price that is annoying and upsetting to say the least. We asked for a ground floor king bed with a queen sofa so I had room and places to sleep should the night go bad so my dh could get a good night sleep and my service dog which is allowed by law at no extra cost and without shoving me in a lesser room could fit. Well they heard service dog and stuck us in a pet room making it hard to move with her when sleeping and the bathroom had no heater and no vent so we could not shower until the morning or the room would be a steamroom and hard to sleep in. The shower head was so high and I stand 5'6" and not adjustable in any direction making that impossible without getting help to even adjust the stream. Lastly the back door for door B had water dripping and freezing and no one came to address it and was like that all night into the next morning with lots of black ice, despite my call to the front desk. Lastly the closest labeled disabled parking spot was too far and had no access to the any walkway, so what is the message? If you have special needs of any kind do not go here. They also never told us about the change they made until we walked in the room and at that point there was no talking to them. My dog slept nicely on her pad and we were very quiet even when we played nicely, it was just hell at night getting up with her due to the lack of room, thank God I did not have a walker it would have never worked out and I would have been in tears at that point, I just do not get it we had the whole family stay here last July for a wedding and we were here before just not with the SD and they treated us so poorly. What gives? Don't go here. Hello Ms. Larson, I am very sorry about the troubles that you encountered during your stay. I would like to address as many of your concerns as possible right now. I know that I am personally responsible for changing your room type from the King Bed on the first floor to the pet-friendly room with two queen-sized beds on the first floor. 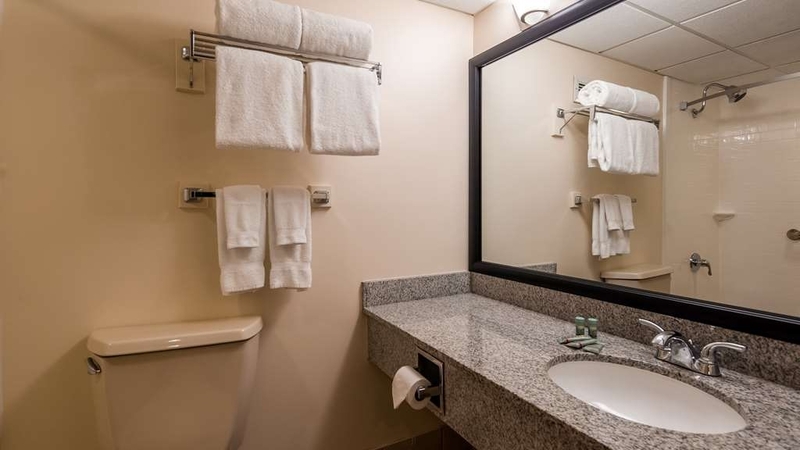 I can assure you that all of our rooms here at the Best Western Saranac Lake are the same size in area with the exception of 4 rooms (two upstairs and two downstairs) which have ever so slightly more square footage(10 more square feet per room). I apologize if this room move to a pet friendly room negatively impacted you in any way and I can assure you that was not my intent. Had I seen that you had reserved a handicap accessible room and had the Service Dog with you then I most certainly would not have made any changes to the room type, however, whenever possible we do like to keep pets in only certain rooms to prevent against having people who are very sensitive to pet dander from being exposed and having adverse reactions when staying in our non pet-friendly rooms. I was here for your arrival and if I had been made aware of any concerns you had from a physical standpoint I would have been happy to address them and do our best to accommodate your every need. I know that we were at very high capacity and that none of our handicap accessible rooms were available on Sunday, however we would have certainly brought you a tub chair or bench and we would have done anything in our power to assist you with getting to and from your vehicle to the room and back. We were not made aware of these concerns until now. Our high level of occupancy could have also accounted for the lack of handicapped parking spaces available near your room. Concerning the walkway at door B, I can assure you that keeping our walkways salted and shoveled and free from ice and snow in the winter time is of the utmost importance to us and we actively address all of our walkways on multiple time a day basis throughout the winter months. I am very sorry for the experience you had here at our hotel but to say that we discriminated against you is just not accurate and that is not something we would ever do here. I would be happy to offer you a 50% off a one night stay or a free night on any 3+ night booking with us in the future and hopefully we can show you a much more hospitable stay and do more to accommodate all of your needs. We do take our level of service very seriously here and I apologize for not going above and beyond to make your stay as enjoyable as possible. If you do consider staying with us again and would like to utilize the discounts offered, give us a call at the hotel directly and you can speak with me personally. Again, my sincerest apologies and hopefully we can show you that we can do a better job in the future and now that we know the concerns you have we can address them all beforehand and ensure that all of your needs are met. We have stayed here before and had an enjoyable stay. Not this time!! While this is generally a nice simple hotel, you should be aware that during the winter they host hockey teams that come for tournaments. We had pee wee hockey teams staying and they were loud, running through the halls, yelling late at night after quiet time(10pm) and screaming toddler in the room right next door!! Had I known, we would never have stayed here. The response of the front desk was what really bothered me. He said "its hockey" with a shrug of his shoulders. This let us know that that is what is important to them, not their occasional visitors. I get it, but they could have let us know before we drove 6 1/2 hours all the way up there! So just be aware that if you come up in the winter, it may not be a very quiet or peaceful stay. This hotel and the staff were nice. The rooms were clean and warm, even when the temperature was below zero. The only time you knew it was cold. cold outside by the weather channel or the local news. The only thing is towels could be softer. I know what you're thinking about Best Western but this stay changed my opinion. 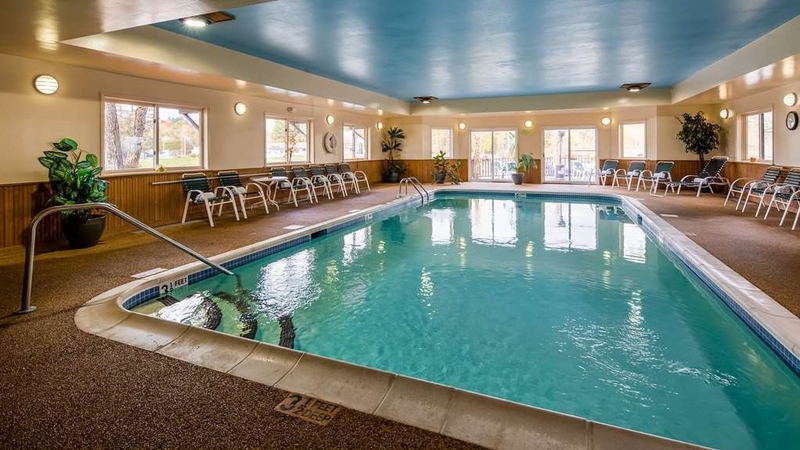 Great stay with warm, inviting indoor pool to take mind off -20F chill outside. Perfect for warming up after ski and outside play. "First Night 2018 Saranac Lake"
The room was well appointed but had trouble getting the key to work. Not sure about magnetism with phone or not. Great coffee in the morning, super to have fridge and microwave for snacks after midnight. Bed was super comfy too. Difficulty in regulating the room temp - it was very cold and the room kept get getting a bit too warm for our taste. But never cold!! 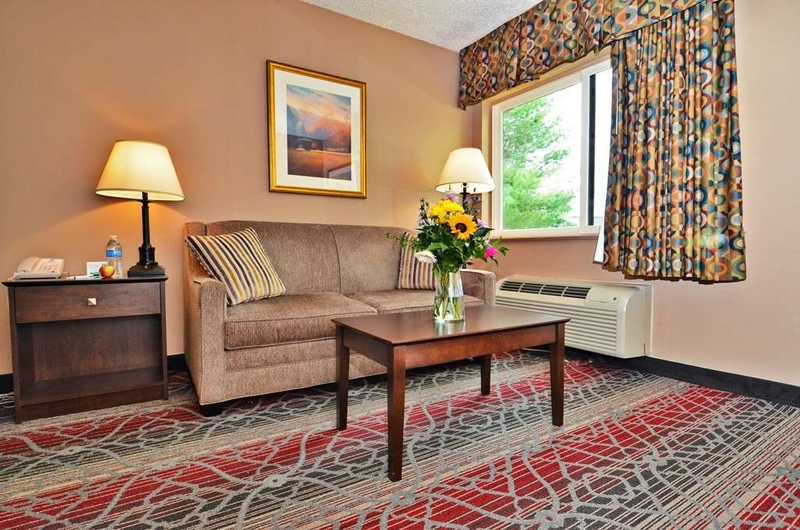 We chose Best Western Saranac Lake because the prices were much more affordable than Lake Placid. Lake Placid is about a 15 minute drive, so if you want to be able to walk places this wouldn't be the place for you. The rooms are spacious and clean. The beds are comfortable. There were a ton of super puffy pillows. Getting a crib (they gave a playpen) was easy. Noise wasn't an issue. There is a nice TV with an excellent range of channels available. There is a mini fridge, iron and microwave. No safe though. There is a nearby Aldi (odd grocery availability), McDonalds, Pizza Hut and Dunkin Donuts. The front desk is very helpful with schedules of public skating and other athletic events in the area. The swimming pool is well maintained, but there was no hot tub or sauna. The landscape surrounding the hotel is lovely. The only problem is where we stayed didn't have an elevator (room 206), and we have a baby with a ton of luggage and a stroller. Bringing the stroller up and down the stairs was difficult. We didn't get breakfast at the adjacent restaurant...though it never seemed open? Lake Saranac lacks the charm of Lake Placid, but if you're looking to save some significant money and not stay in a dodgy place, this is a viable option if you don't mind driving. We have stayed here often. Only a few problems over the years, which were taken care of quickly. Comfortable bed; we appreciate having some pillows that are not too fat. Pillows with too much loft are bad for the neck and are uncomfortable. We had a wonderful time staying here. The staff was friendly and the place was cozy and met all our needs. I would recommend to others that are going to stay in the Saranac Lake/Lake Placid area to book into this Hotel. "It could have been a better experience"
While the location was perfect, and the property was nice, the pre-arrival issues were concerning. I understand that there are policies in place for the protection of all with respect to contracts and prices, but we were there as a group having booked 17 rooms, and we had one family that missed the deadline for reserving at the 'better' rate due to a medical injury which could have prevented them from traveling. They phoned the hotel prior to the deadline to explain the situation and were told it was no problem. When they got the 'all clear' from their doctor, they phoned back the day after the deadline and were told too bad, they would not be given the rate. I then phoned to clarify as I thought there must be some mistake, and was told in a mocking way that no, they would not be given the lower rate, rules were rules. I get it, and they are technically correct, but it was the wrong foot to start off on for sure given the circumstances. 'It's not that much money, what's the big deal?' was what was said to me, to which I said, 'I agree, it's not, so why is this an issue?' There was another family in our group that booked late and did not receive the discount, they were late with no good reason, I did not argue on their behalf as there was no excuse. We plan to be back next year for the tournament, and I travel to the area several times a year, guess I won't be staying there again. It's too bad, the staff at the desk once we arrived were friendly and the property otherwise was very nice. Management needs to take some lessons in customer service, especially when someone had a conversation confirming something beforehand. Very friendly staff. Our room preference was at first only partly honored. After we asked again we luckily got another room, the only other left. But then it was quiet. Our room was very spacious and it was clean. The hotel is in a convenient location. There is a pond next to the hotel which is nice. The pool is very nice to swim in. The restaurant next door is very good for breakfast. "sewer water coming down in shower ceiling"
Staff didnt care to even look up at me when I complained . There was never a we're sorry or let me do some thing for you just yeah yeah we're looking in to it . The maid staff was vaping in the hall and the smell was so bad it was crazy . 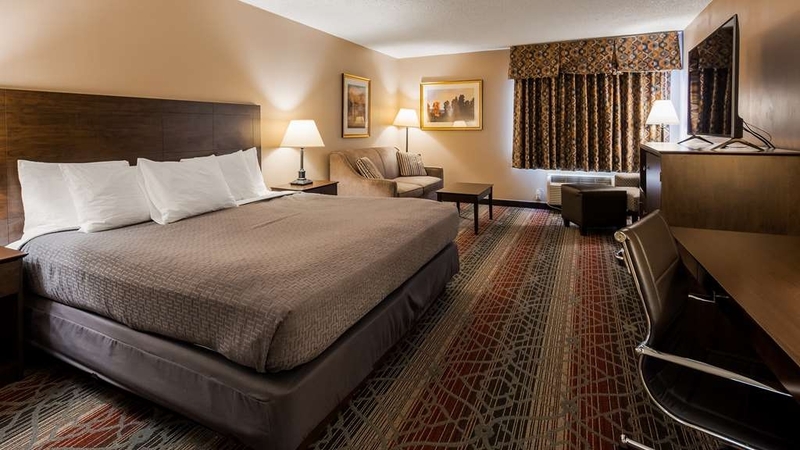 "Best Western Saranac Lake - NY"
Overall very good - helpful staff members - just recommend that the mattresses and pillows be replaced for improved comfort. The hotel being located close to Lake Placid was great as well. Oh yes, a superb restaurant just out in front of the hotel. "Best Western Saranac Lake, NY"
Good hotel for a short stay in the area. 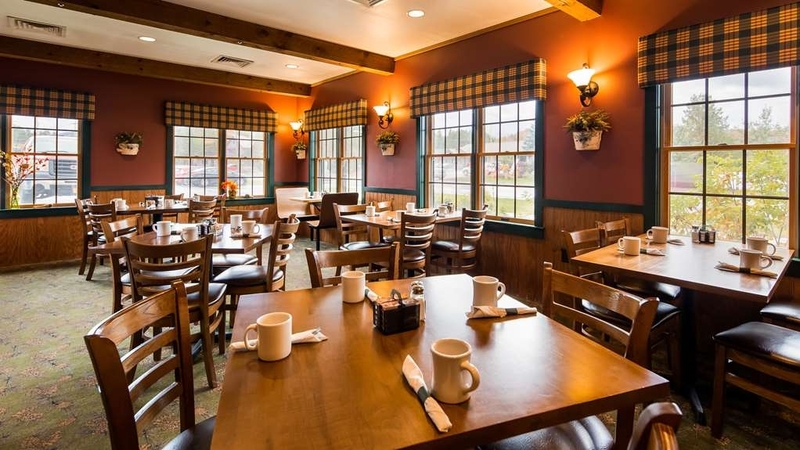 8 miles from Lake Placid, there is a nice Breakfast/Lunch restaurant next door (10% discount), and a few other eating choices within walking distance. Pool is nice but there is no fitness center. Beds were OK, pillows were marginal, towels were OK (not better than OK). Rooms had refrigerators and microwaves Free Wifi was mostly reliable, some people in the party had issues on some devices. "One night stay, convenient location "
For what we needed - one night on our way to the ADK high peaks region - this hotel worked out well. Conveniently located, we finished our journey in the morning. Staff was friendly. Rooms are a bit outdated and the bed was lumpy... but given what we paid, this was fine. Shower floor was pretty dirty, but we didn't need to shower. For one night stay, it was good. "Our New 'Favorite' Hotel in the Adirondacks"
Close to all the sights and sounds of the Adirondacks, but away from the hustle and bustle (and inflated prices) of Lake Placid. 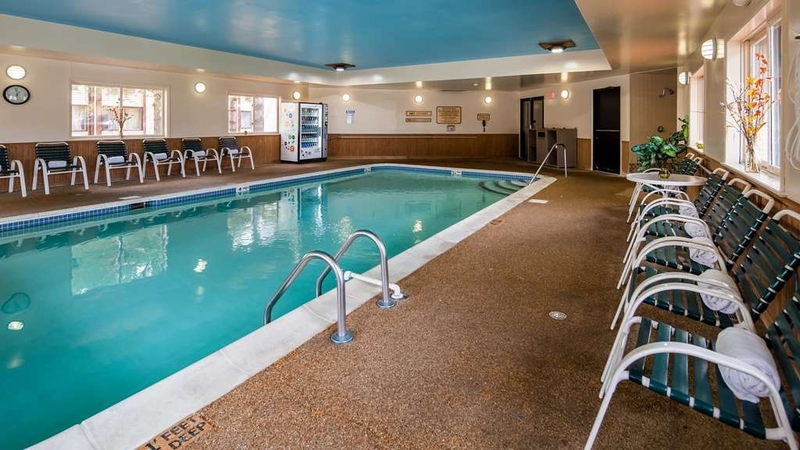 This is a clean, comfortable Hotel with a friendly staff and a nice indoor pool. Breakfast isn't included, but you get 10% off your bill at McKenzie's Grill, located in the parking lot about 25 steps from the Lobby. I had the best Eggs Benny I've ever had in my life ($8.95) and my wife had a massive veg. omelette for the same price. We'd rather pay a few bucks for a superb breakfast than to greet the day with stale bagels and cold scrambled eggs. You know what I'm talking about. We'll be back. "Clean and Comfortable hotel in the Adirondacks"
This hotel was very clean and beds were so comfortable. It was also nice and quiet at night. It is located in the quaint village of Saranac Lake, on a route for easy travel to Lake Placid and other Adirondack mountain destinations. A comfortable enough bed in a nice enough room. If you eat at the restaurant out front they give you a 10% discount for being a hotel guest. The shower was fine, towels were fine and there was a good amount of pillows. 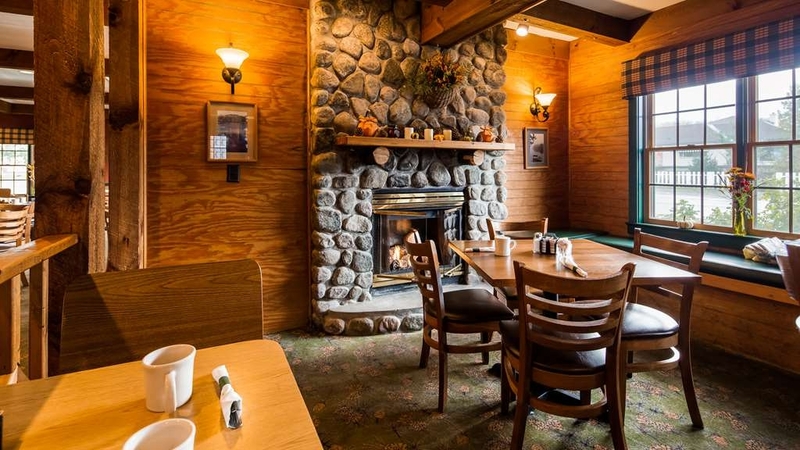 "Good location, close to good hiking/Lake Placid, but no breakfast"
In the age of most hotels, especially BW's, providing included breakfasts (understandably, they aren't free), it was disappointing to not have breakfast included. We chose a nearby fast food restaurant as we prefer to not spend a lot of money on breakfast. The place itself was fine, no complaints. Beware when booking a room as we were that there is no elevator - fine for us, but might be an issue for others. Which is why we had a slightly cheaper rate for a 2nd floor room. It was fine, clean, and we would stay here again, esp since the hotels in Lake Placid for the same night were at least twice as much. This wasn't any kind of place to write home about, but it suited us for 2 nights with no issues. 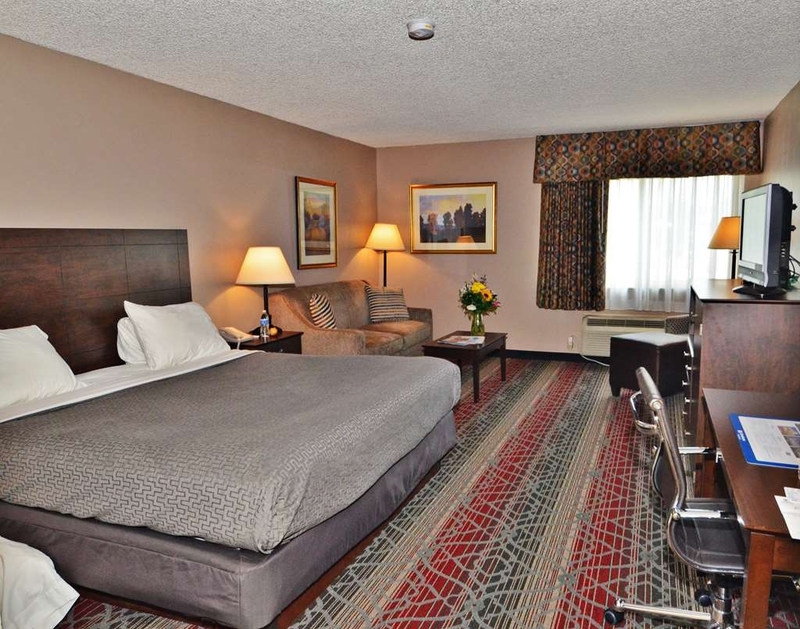 "Spacious rooms, great price, great staff. Convenient location, nice restaurants within walking distance"
Spacious rooms, great price, great staff. Convenient location with exceptional cost. Some nice restaurants within walking distance. Recommend Blue Line Brewery, unique low key place with good food and drinks. Breakfast located at restaurant across parking lot. Nice hotel for a stay over at great cost. Excellent and clean hotel in Saranac Lake NY. No problems or complaints about the room or the service. Highly recommend to anyone staying in the area. Hotel location is near to many other area sites in the Adirondacks. Very nice and CLEAN rooms! The Staff were very friendly and welcoming. Great Service! Situated in a convenient spot. Enjoyed our stay very much. We will go back! Nice breakfast and lunch restaurant, offilliated with hotel and they gave you 10% off your breakfast or lunch if staying at motel. Nice view! Average. Room was very cold, heat did not work. There was hair on all bedding and pillow cases at arrival so I requested fresh linen. Staff was friendly and went out of their way to provide fresh linen and try to assist with heating problem. We enjoyed a quick overnight stay on the way through the area on Columbus Day. We thought about staying in Lake Placid but it didn't fit the budget. Saranac Lake was a short drive. It's a nice hotel in a nice area. Great friendly service at check-in. Would highly recommend. Pet friendly room are spotless!! Staff is friendly. Responsible pet owners should stay here. The grounds are maintained for everyone to enjoy so PLEASE Just remember to clean after your pet so we can continue to stay here. Very local to all attractions in the Adirondacks, but far enough away for a peaceful nights sleep. Close to places for eating, accessible to get in and out of even when it's busy, lots of places to choose from for morning coffee with a DD right around the corner and plenty of gas stations to fill the vehicle up with for sight seeing. Very clean and quiet hotel. Staff is very helpful. Very affordable for area. Within walking distance to several restaurants and stores. Nice views. Only stayed one night so we did not have time to use the pool but it looked very nice. Would definitely recommend to others. 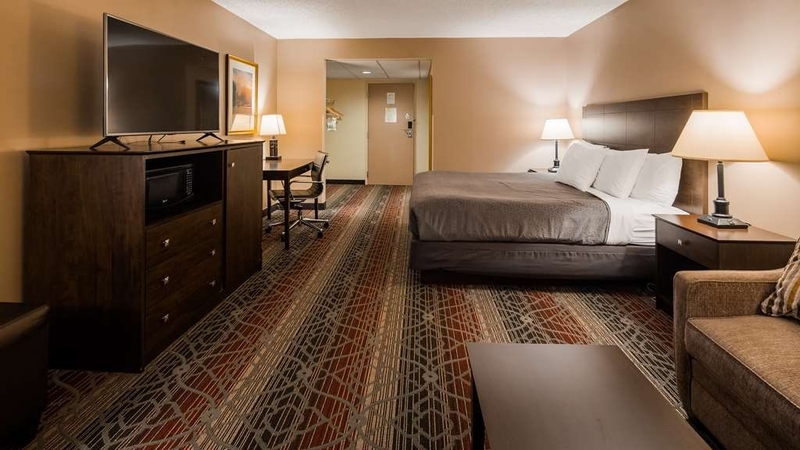 I never stayed at Best Western before, but I will say this, I do a moderate amount of traveling, and I will absolutely try and reserve Best Western first. Charlie at the front desk was a real gem. The next time I'm in Saranac Lake, I will be staying there! 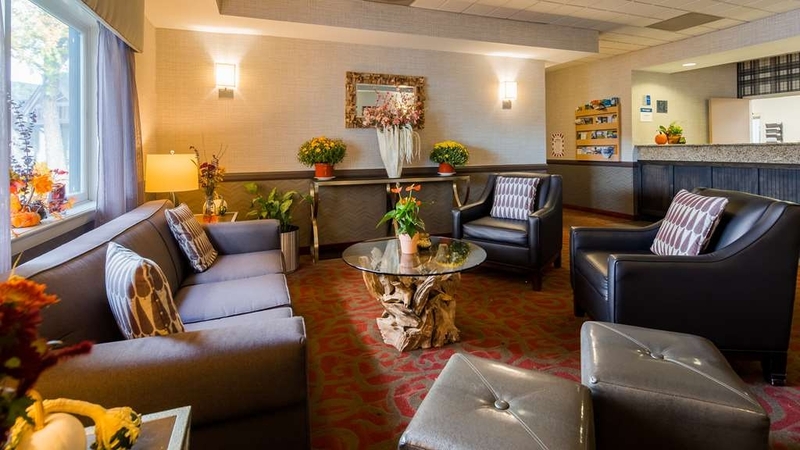 The Best Western Saranac Lake is a great place to spend some time in the beautiful Adirondack Mountains of New York State. 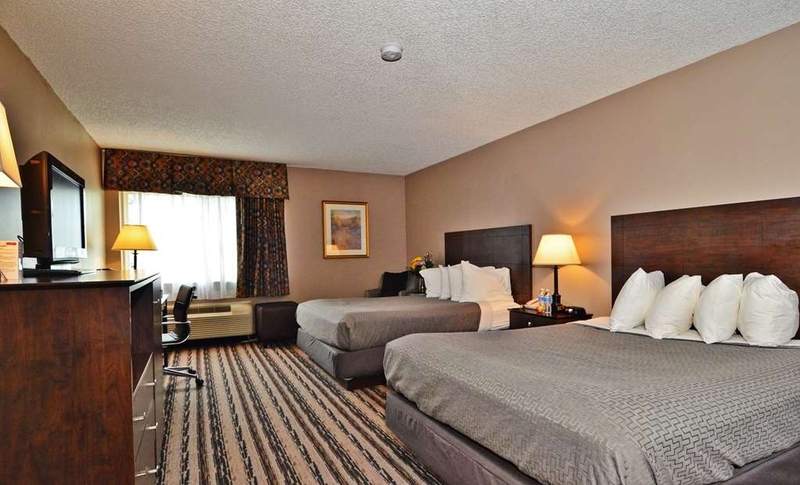 The hotel is in a great location, and offers clean, quiet, comfortable, affordable, pet friendly accommodations. The staff is pleasant and helpful. The hotel room has a mini-fridge and microwave. There is an indoor pool and exercise room available to guests. 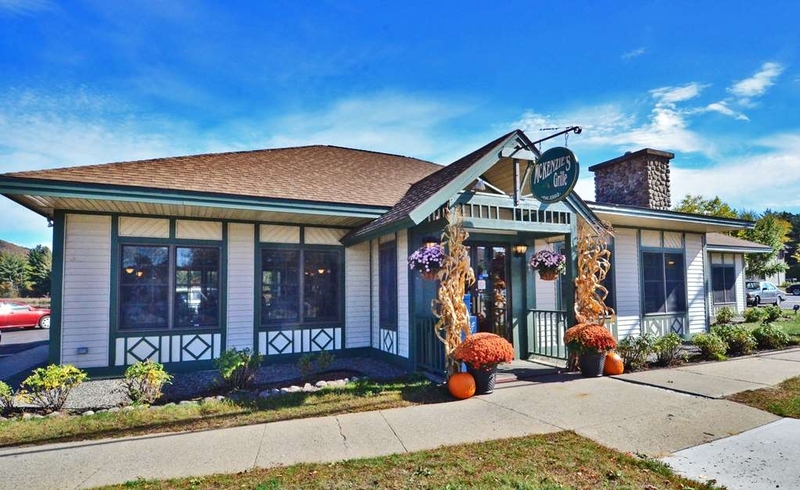 The hotel partners with McKenzie's Grille, a cozy little restaurant located across the driveway that serves up delicious breakfast and lunch with a 10% discount for BW guests. 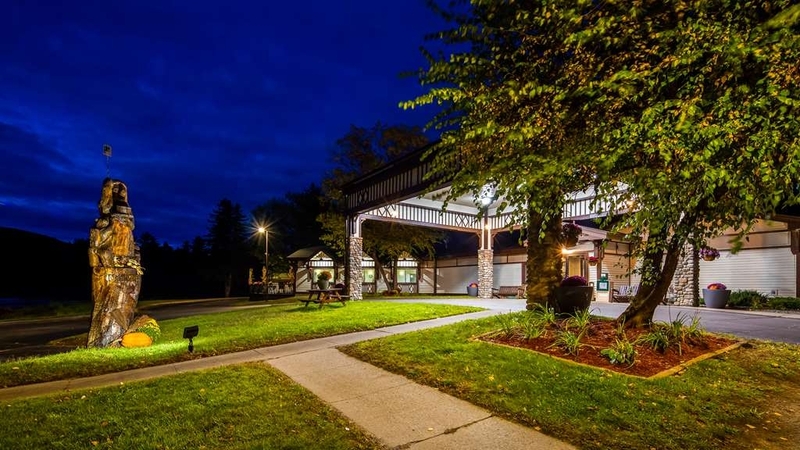 The Best Western provides the comfort needed for a good night's sleep so travelers rise in the morning refreshed and ready to enjoy the serene beauty of Saranac Lake. Only stayed one night but it was very good. Friendly staff throughout stay. Clean and updated room. Discounted breakfast at a little restaurant next door. All first floor rooms which was wonderful! Will stay again! Stayed for 2 nights mid-week on their cheapest deal of around $99/nt in the last week of September. Location is good, outside the town (2 minutes drive to town centre) but plenty of restaurants, a gas station and some larger supermarkets on door step. Large and easy parking lot which wraps around hotel. Check in took some time, they couldn't find our reservation and once found made no mention of our special requests. Allocated room 209, a king room, sofa and coffee table plus desk and tv console with microwave and refrigerator. Tiny bathroom. Room overlooking the generator for the swimming pool which was noisy and hummed at all times so no good to open window. A/c worked well but also very loud. Bed was large and comfy so at least a good night sleep was had. Not much noise from neighbours but walls were thin. Bathroom was pretty dank, 1 sink and toilet which almost touched door so certainly couldn't open/close it from a ‘seated' position, quite a ridiculous situation in what was a large hotel room. Bath was useless and old, no good for bathing and shower surround wouldn't hold shower products so was pointless and ugly. But it was a bathroom and the water pressure was good so I guess it was ok. Ice machine good on our level. Swimming pool made everything hot and humid, the corridors were very warm. Overall the hotel was fine but I expect the same could be had for less $$ in a motel. Have had a couple of great stays at this hotel. Service is excellent, rooms are comfortable and clean. Great location. Has all amenities we needed except continental breakfast. Tub was clean but stained from wear. "Typical Best Western stay. Walking distance to restaurants." Typical Best Western style, no elevators, so if issues with stairs be sure to request a first floor room. No free breakfast. A bit of a distance from the center of town, but close to other restaurants. The hotel though not downtown is on a main road, so we did sometimes experience issues pulling out of the hotel parking lot due to heavy traffic on the road. Both nights staying at the hotel we walked to local restaurants. One night was a Mexican place, which is right next door and the other night a Brew Pub which was just a bit further down the street. The other places that I recall within walking distance are a McDonalds and a Chinese food restaurant. "Basic room with basic amenities"
The room was clean but very basic. The mattress was too soft and my husband and I both had backaches in the morning. The hotel was booked solid and we stayed 3 nights. The staff were very accommodating, helpful and friendly. I felt that there could have been more amenities (maybe a shower cap and lotion) and a larger bathroom for the price we paid. I usually stay at Best Western because of their reputation but there was no breakfast on site or even coffee. I would stay again but only for one night. This hotel was close to town, across the street from Lake Flower. McKenzies Restaurant shares the parking lot, where we received a 10% discount on breakfast as a hotel guest. The grounds were very nice and clean. Our room was very comfortable and clean, missing just a few of the finer amenities. Every room has a Keurig coffee maker :-). The TV was small. The second floor is not handicapped accessible. Dogs are allowed with limitations. We loved our stay and shall return again while visiting Saranac Lake. "Pretty far from the center of town"
This is a clean, modern Best Western hotel. My room was relatively comfortable, although the lamp next to the bed was broken. The hotel is on a strip by a lake south of town that is home to a number of old-time Adirondack motels. 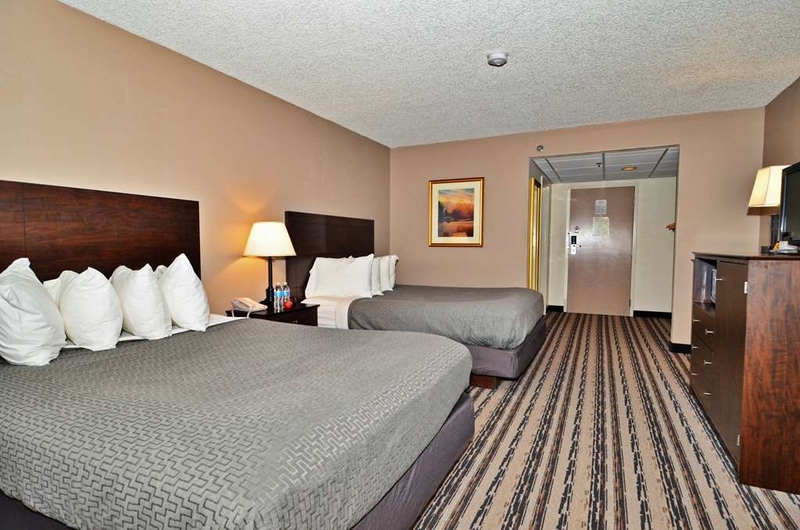 The Best Western is toward the end of the strip, and that means about a 30-minute walk to the center of town. During the day, the lake provides some scenery, but at night the road is dark, lonely and busy with cars. There are a few restaurants nearby, but the best ones are in the center of town. I came back to the hotel tonight af 8:30 after eating in town, hoping to have a nightcap at the hotel's restaurant/bar next door, but it was already closed for the night! So, if what you want is a nice modern room at a decent price, and you plan on coming and going in your car, you will like this hotel. If you want convenience and access to the town, this may not be for you. The beds are comfy and room very clean. Could use a more modern bathroom, but perfectly acceptable and clean. Staff also were great at making sure I applied any discount possible to the room. I was absent minded and didn't think about it and so they were able to save me a few dollars. 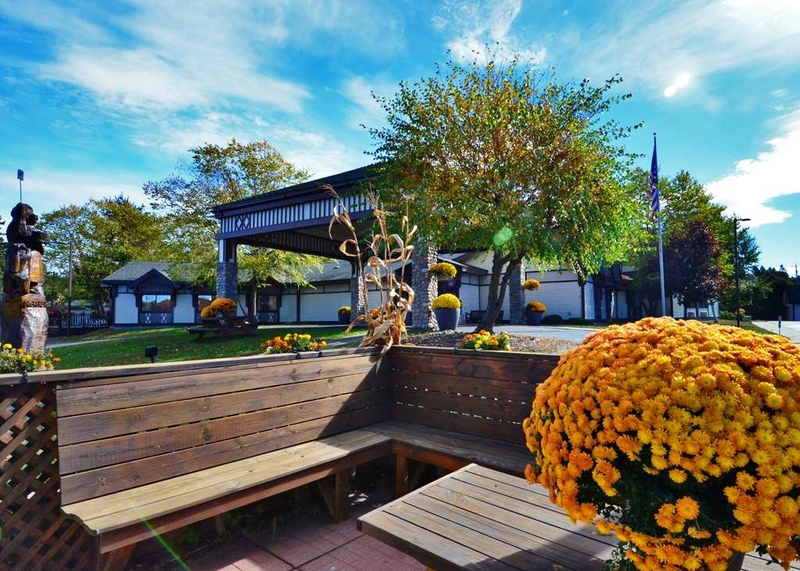 Best in value of all hotels in area during the Fall season. No major problems. Nothing out of the ordinary at this hotel. Staff was courteous and helpful. 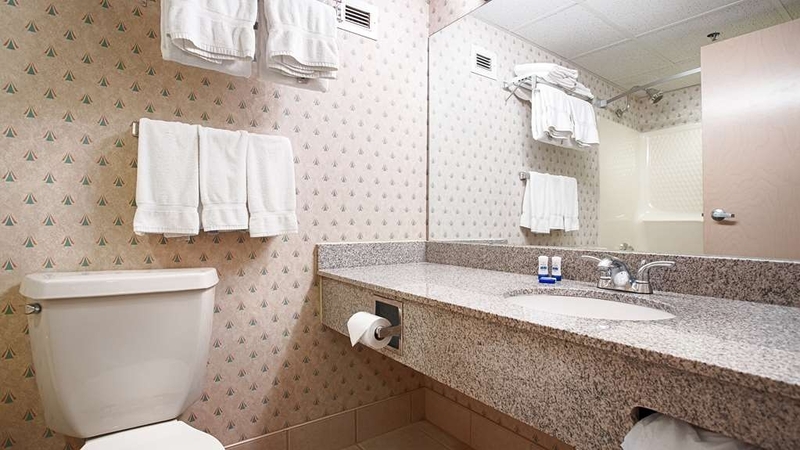 Hard beds, slow wifi,small counter space in bathroom,no continental breakfast. They have connecting rooms so if you are not a fan of this request no connecting room when you book. You can get 10% off your meal at the restaurant next door, which we did not try. Food within walking distance of the hotel-Chinese buffet, Italian, a wine and grill and a MCDonalds. Also within walking distance is an Ace Hardware, Aldis and Dollar Tree. "Very friendly, helpful and clean!" Our stay was great! We stayed here at the heart of tourist season and were still treated like the only people in town. Great restaurant next door that actually even shares the same parking lot! The staff was very informative and was genuinely excited to greet us. The rooms were clean and the shower pressure was phenomenal! "Not as picturesque as shown, clean rooms"
Clean hotel with good rooms outside Lake Placid, but still very close, so worth it if you don't want to be directly in town. The room was well-kept and clean. Not much to say about it as we only stayed one night and did not really spend much time at all in the hotel. When we checked in, the staff member on duty was courteous but not particularly helpful with questions, but it was relatively late. Average, nothing more. That applies to this hotel, the things to see/do in this area and the local eateries. If I knew then what I do now I would have stayed in Lake Placid. The pool seemed horrifically over chlorinated (or the pool room under ventilated) based on the odor. The staff went above and beyond with our stay, helping to make us comfortable. My wife had broken her leg the day of our arrival, and the staff was very helpful in helping us with making her comfortable. Hotel was adequate. This is the only hotel that we stayed in on our extended trip to NY that did not offer a complimentary breakfast, water or coffee. Check in staff not overly friendly. But room was OK. Overlooked a small closed area in which there was a small garden. Could see the front office. Nothing special, but window opened and the night air was wonderful and refreshing. If you presented your key at the restaurant next door, a 10% discount was given. Food at McKenzie's was adequate and not overly priced. Nothing special, but was fine. Will return if we make it back to this area in the future. The toilet seat was loose. When I called the front desk, I was told that there were no maintenance personnel available. I don't typically stay at a Best Western, but it was a direct bill for a client so that was the only choice. I have to say I was quite pleased and surprised. My room was very spacious. 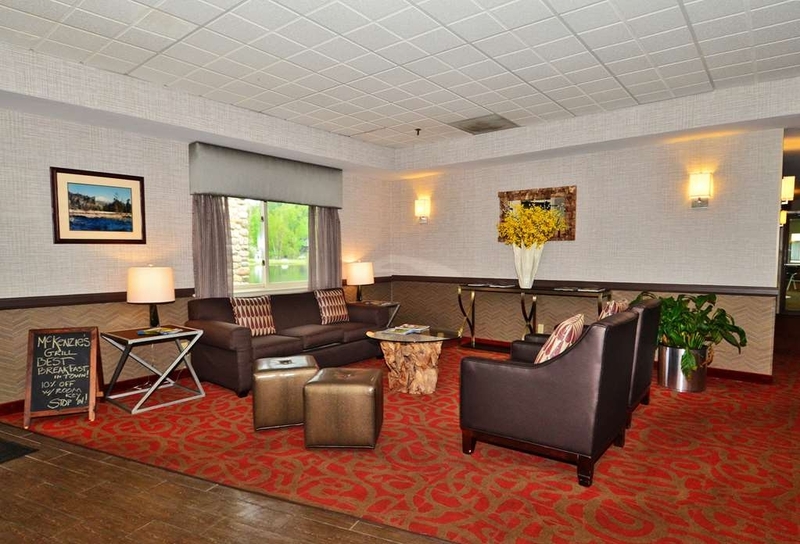 The amenities were mediocre, but what do you expect from a budget hotel? I didn't use the pool, but they had a very nice looking one. Within walking distance of a few good restaurants and across the street from the lake. The staff was very friendly. Obviously, it doesn't have the charm of some of the B&B's in the area, but it was a nice experience. Thank you very much for your kind words, Gary! We are glad that you were pleasantly surprised! We hope you consider staying with us again. Hotel was conveniently located just outside of Lake Placid on flower Ave. Choice of many restaurants within walking distance. Excellent restaurant next door for breakfast with 10% discount. It is only a 20 mile drive to the Wild Center museum and walk in the tree tops. Thank you so much for your five star review! We hope you come back and stay with us again. Thank you so much for your kind words, Mark. We hope to see you again someday soon! During a 10 motorcycle trip this was one of our last stays and we enjoyed it very much. Great check in, clean rooms, and they now have a covered area for motorcycles which was well appreciated. The Diner next to the property was great and you get a 10% thanks to BW. I would highly recommend this BW when visiting the Adirondacks. The service was excellent. Hotel and rooms and bathroom were immaculately clean. The air quality inside hotel was very clean and fresh. 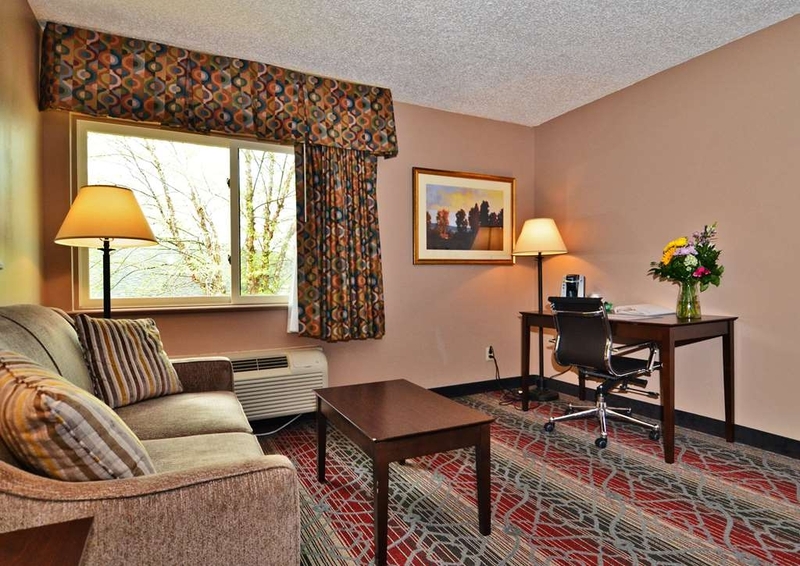 I have always stayed at Best Western for the quality, cost and comfort that they offer. Thank you so much for your kind words Constance! We hope to see you again someday. I have been staying at this hotel for four years now when I bring my daughter to and from college. You can always expect a quality room when staying here. You may pay a little more, but you get what you pay for. The hotel was nice located in a quiet area right across a small lake. You receive a 10% discount from the breakfast restaurant next door when you show your room key. Overall the stay was nice and quiet. Two floors no elevator, but shouldn't need one. Outside benches available by a pond. The downside to this hotel is that there is no elevator and on a 2 week road trip from the UK we had 3 heavy cases. Being allocated an upstairs room there was no way that i would get those cases up the stairs without destroying my back. Being a Friday night the hotel was full, however the staff went beyond their remit and sorted me out with a downstairs room despite it clearly causing the staff an administrative headache. I'm truly grateful to the staff including the night manager who worked hard to help me. Thank you sir and your colleague. The hotel is well positioned with its own homely restaurant next door. It's not cheap but it's a decent hotel. Helpful and polite (without overdoing it) staff at every interaction. Bed was not terribly comfortable and shower had definitely seen better days, but room was clean and furniture otherwise in the room was nice. Pool was clean and the laundry facilities were in working order and also clean. (Pool also had an outside deck which was a delightful surprise). Building was secure, and location was excellent. We were very thankful for the clean, relatively quiet and spacious room we rented for one night. Comfortable bed made all the difference! The small pond out back created a serene peaceful atmosphere. The only issue was an intrusive spotlight up on a post which was directly positioned into our window. It was in the rear of the hotel where the "quieter" rooms are located. This should go off at night. Great bed and genuine cotton bedspread. Good channel selection. Overall, nice room. Bathtub did not look inviting and very small soaps. Nice towels, big laundry bad, good lighting, Keurig was nice touch. Reasonably priced, good location. Front desk not very friendly or hepful. Did not recognize BW status, and reluctantly helped me with wifi. I was a little late checking out and guy was quite short with me. Customer training needed! They give the impression they are overwhelmed and customers are a pain. Overall very friendly staff. The room the clean. For the price we paid however i would have expected more amenities. No breakfast was included. The rooms were average. For the high price i expected more. Pet-friendly hotel that offered a comfortable night sleep when it was too rainy for camping. Reasonable pricing when compared to other area accommodations, especially the pet fee which was $15. Would stay here again! "Dated, a little dirty, but ok for price and location"
The hotel is old and is in need of updating. The room was tiny and I felt like the bathroom was cheaply made (when I sat on top of the toilet lid, the lid actually sank in...I'm not that overweight!). The mechanism to fill the bathtub was broken (needed to bathe my infant) so I actually used a cup to slow the leak. I liked the pool; it was a decent size and the pool water was warm. The grounds feature a few chairs and a nice swing in view of the pond. The location isn't bad but I think I'll stay closer to Lake Placid next time. An overnight stay an only available hotel for the busy weekend. It was about an hour away from our meeting place, but we booked late. Very nice hotel and clean. The room was huge and spacious; but was pricey for a BW chain and what i normally pay. Desk agent (older gentlemean) was very knowledgeable and check-in was smooth and qucik. Since it was such a short stay, we didnt explore much. Restaurants are close by and you get a discount for the one closest to it (sorry dont remember the name). Very scenic, unfortunately didnt get to enjoy much. Would definitely stay again. This is our go-to place to stay in Saranac Lake, always clean, very nice staff and the food is delicious next door at McKenzies. The hotel is easy to get to and has plenty of parking. They are also pet friendly! "It's unfortunate, but this could have been a better review"
My sister and I stayed for three nights. Overall, we were satisfied, however, on the last night when I had to go back out to my car later in the evening, and although there was something we thought strange in the parking lot, we ignored it. Upon going back in, we noticed that the card/key opened the outside door while the red light was still on. I inspected and found the door to not be closing and noticed a small pile of little rocks were put under the door to keep it from locking. I removed them, secured the door, and reported it to the front desk and was told that someone probably had stones in their shoes which I knew was not a possibility (these were large stones). He checked the door which I already locked. After about 20 minutes we went back out to that door and found it to be open again with more stones wedged under, so we reported it again. This time we were told it was probably someone out there smoking. When we checked out the next morning, we mentioned it to the morning person at the desk. He didn't seem to really care, said they couldn't keep track of people coming in and out, and they were just responsible to make sure we felt secure in our room, which we did. However, it would be nice to feel secure in the hallway just before midnight knowing that outside doors are locked. Even if staff planned to do nothing about the problem, it would seem it could have been handled better. I've never had this happen in another Best Western or other hotel. It's hard to know what was going on in the parking lot and who was coming in and why, but would think staff would have some concern about why that was happening. It seemed that possibly it was something they were aware of and just didn't care. "Poor customer service from Manager"
Management has no concern for guest's beds and makes no effort to attempt to redress issues. The sole courtesy extended was a phone call however it was clear from the outset that he had no intend to resolve the issue. "Great place to stay in Saranac Lake"
"Iron Man Event rates go up"
Rates went up for Iron Man contest but didn't go down that evening after contest was over. Hotel was clean and the service was warm and friendly. The night staff did there best. If I knew others motels were around I guess I would stayed some wear else. Not from the area we try to book as we are on the road. The hotel is much different than the pictures. You should be prepared for not getting what you expected. The hotel is old and needs to be renovated. The rooms we're not clean, bathroom was dirty to the extent we decided to use our flip flops just like camp. We had a couple of filthy towels. In addition, there is no breakfast and the hotel offers a restaurant across the parking lot, which I think is managed by the same owners. We only wanted to get away as soon as possible. On behalf of our entire team I would like to apologize for not meeting your expectations. Our hotel is almost 30 years old now, however, within the last year we have replaced the carpet throughout the entire building, purchased new furniture and bedding for all 69 of our guest rooms, and did an overhaul of our landscape. We are constantly looking for ways that we can improve our guests experiences and in the case of your stay, we obviously fell short and should have done a better job. We would love an opportunity to do a better job for you in the future, so if you do consider staying with us again, please call us directly at the hotel and speak to myself, or Jim, the owner so we can make sure to address the concerns from your previous stay. Again, I apologize for your less than desirable experience and we will try to do a better job moving forward. "Basic hotel. Not much to expect"
I will start with the man at the front desk (Bill I think was his name), that was a very nice and welcoming person. But all the rest was average on lower side. Basic room, very outdated and needs refurbishment, no breakfast and a view to the parking lot. I think that when you pass by just for overnight, you can live with it, but be aware that it is a bit overpriced. Stayed here one night booked last minute. The rate was high but comparable to the other hotels in the area. There's are plenty of restaurants to eat within a 5 minute walk from the hotel but the center of town is not really in walking distance. Nice lake view across the street. Staff was always pleasant and helpful. My family and I were only there for one night to visit my son's college. The hotel was nice and clean, the staff was very welcoming, friendly and informative. The only complaint I would have is that the area can benefit from more restaurant options. "A well-run hotel at Saranac Lake, New York"
For our 7-day stay in the resort area of Saranac Lake, New York, this hotel provided all of the amenities that we needed - clean, efficient, and staffed by highly responsive person The location is within walking or short driving distance from businesses and restaurants in Saranac Lake. They do not supply breakfast but there is a restaurant next door. Stayed here 4th of July for two nights. Way overpriced like everything else in Lake Placid area. At best the room was a $ 65.00 a night room not the $ 200.00 a night I got robbed for. I have stayed in suites at the Hilton for less and the Hilton had breakfast included. The hotel sits on a very busy two lane road so be careful entering and exiting the parking lot. The staff is friendly enough but no different from any other hotel. If you do stay here be prepared to not get what you're being charged for. All the rooms do have lovely views of the parking lot oh and there's a pond next to the building with a couple of chairs and a tired looking table. On behalf of our entire team I would like to apologize for your less than desirable experience here at our property. We do price our rooms in relativity to demand and are always significantly lower than comparable properties in the Lake Placid area. We do our best to make our guests feel comfortable and apparently in this situation we fell short. We appreciate your review and we will take your critique to heart and try and do better to provide a better experience for all of our future guests. 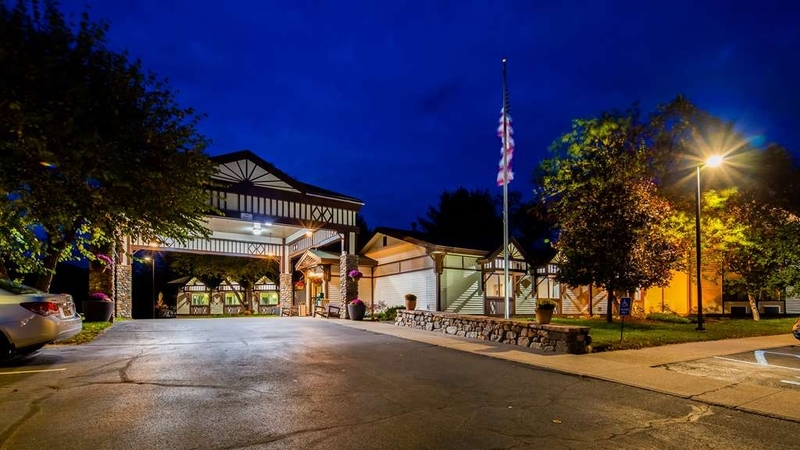 "Best value in the Adirondacks"
The Saranac Lake area is in the heart of the Adirondacks and this hotel is the place to be. 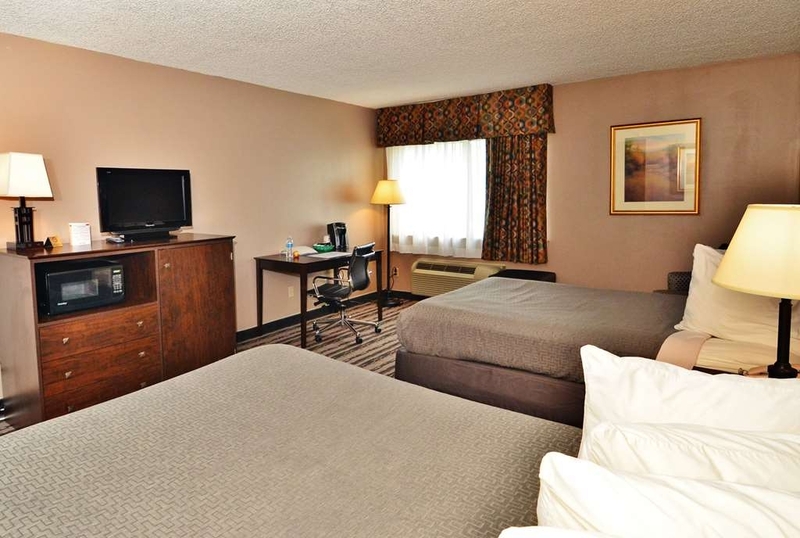 Just steps from hiking, lakes and close by attractions, we found the location of the Best Western to be ideal. We loved the kind and professional staff and the room was cozy and clean. The hotel could use an update with redecorating but was pleasant enough. "Above Average Prices for below average hotel"
Stayed in Best Western Sarnac Lake for one night. The toilet bowl in the bathroom was cracked. For the price they were charging which was $144.00, complimentary breakfast should have been offered. Overall the staff was nice, but there was a smell of cholorine throughout the building due to the pool. It was close to shopping and gas centers. I had higher hopes sticking with a chain but should have maybe tried a local spot instead. Check-in took a while-they were sold out and giving the couple in front of us a hard time because the credit card they guaranteed the room on had been cancelled. They kept telling the couple they were lucky because the hotel still had one room left--but it was the one the couple already booked. My kids got anxious listening thinking our room was gone. Clean, basic room. Lumpy bed. Bagged up 'fresh remote' just seemed kind of gross... View of parking lot with noisy bar across the way. The 'lake' you could view from the hotel was more of a marsh fenced off. One swinging bench and a picnic table sandwiched between parking lot and marsh. No outdoor space to relax. Small deck with chairs piled high, and you got locked out due to the closing mechanism... The second day a tour bus parked next to it so your view of the marsh was covered by the bus. The pool was a hit with the kids and unlimited supply of apples were too. Had a great stay here. The customer service was excellent, no matter the time of day there was someone helping. We checked out at 3am on a Monday morning and the guest service person was super helpful. Glad we stayed here too after hearing about our friends experience with some of the local inns across the street. Would stay here again! Thank you so much for your kind words. We do try our best to be as helpful as possible with our guests. Sometimes the little things we can do make a big impact on our guests and we were happy that we were able to make your stay enjoyable! This hotel was perfect for our overnight in Saranac Lake. The room was very clean and comfortable. While we were disappointed that breakfast wasn't offered at the hotel, there was a restaurant affliated with it that was steps from the hotel, very convenient! Thank you so much for your kind review and your patronage. We hope that you will choose to stay with us again. Although we experienced a couple of situations, such as a lumpy mattress that needed replacement, the front desk and cleaning staff was extremely responsive and very friendly, making the stay enjoyable. Thank you for your review and for focusing on the positive aspects of your stay even when you were faced with inconveniences. We appreciate your business as well as your feedback. Terrible experience 1) Staff was angry at each other due to disorganization, and took it out on myself and our family. 2) We were told we could check out at 1pm. However instead we received an immediately angry smug phone call to inform us to wake our son out of his sleep to get out of the room ASAP due to their disorganization. (my parents had a room at this hotel for the subsequent night, so if it was any trouble for them we would have had my son sleep in their room instead. It could have all been easily avoidable) 3) However afterwards the owner of Saranac BW called me to tell me to inform me that I was a liar and was making the whole thing up. Finally at the end of the call he starts to troll me with a smug attitude and ends it by insisting that I have a "nice day". We will not stay here again, Not quite sure even what to think besides this was just plain insulting and borderline crazy. On behalf of our entire team I would like to apologize for not meeting your expectations. In this case, our team could have done a better job communicating and we will try harder to do better in the future. I hope you accept our apology and thank you for your review. The staff was friendly, the facilities were clean, laundry facilities were onsite were a real blessing. We would stay there again without hesitation. It was quiet and the staff was very helpful. Checkin and Checkout were fast. Thank you Patricia for your kind words as well as your patronage. We do hope you will choose to stay with us again. In this town it is the most modern hotel with the amenities most would consider standard. If you do not want to miss any of these, this hotel is your best and, to date, only option. There are a few smaller motels in town, run with love by their owners, no doubt, but they simply cannot compare to the service offered here. However, for this reason, the price may be comparatively high. Great staff, excellent rooms and bathrooms, Reasonable price for the room, size, and area. Location to other areas is perfect for shopping and dining within a few miles, where prices for lodging is conciderably more. "Pleasant hotel a short ride or a long walk from town"
Stayed here 1 night during a week-long driving trip. Room was functional but had virtually no water view. Short walk to several restaurants but about a 30 minute walk into town (we gave up before reaching town but drove through on our way out). Friendly staff. Reasonably priced. We skipped the breakfast at their restaurant next door (not included in the room price). Items in room were very worn and in need of replacement. Only thing really good was the lovely location. We would have liked more of the personal touches we've seen at othe Best Western locations on our trip. Check-in was easy and the attendant was very helpful and friendly. Room was nice, with lots of space. Found a long hair in the bathtub, but otherwise the room was very clean. The bathroom door is about a half inch from hitting the toilet which made getting in and out of the shower a real challenge. We had to kind of hop over the top of the toilet or close the door, then walk to the sink, then open the door again. Super annoying and stupid. The bed was fine, but the mattress was not great. The mattress pad and sheets were a bit bunchy and weird and the sheets and bedspread were tucked in so that they would only reach up to just over our stomach area. I kept wanting to get them over my shoulders but it just wasn't happening. Floors/rooms are not very sound-proof, but all things considered, not bad for that kind of hotel. "For the price, I would have thought it would be cleaner"
Did a one night stay there a couple weeks ago. The front desk staff was nice, and helpful enough. The property was ok, not old, not new either, but everything in my room worked including the WiFi. My only complaint is that it could have been cleaner, there was trash (bits of paper and so forth) left lying around. For the rates they charge, I kinda expected better. The hotel and room are beautiful, and the restaurants within walking distance are all great. This hotel doesn't have food but you get 10% of the wonderful diner next door for staying here, and the rooms are clean, pretty, and comfortable. Every staff member I spoke to was friendly, helpful, and pleasant. I plan to stay here again someday. Rooms were clean and bed was very comfortable. Hotel staff were super helpful and kind. Definitely go get breakfast at the restaurant next to the hotel show room key and get a discount. Would definitely stay here again. Had all the necessary facilities in the room. Was pretty close to the town. Bed was comfortable . Over all a good place to stay. Would like to stay in future in a best western again. No complaints at all. We have stayed at this property a number of times during the past three years and have consistently enjoyed good size rooms that are well maintained and a warm and welcoming staff. On a couple of visits my daughter brought her dog as the motel allows pets in several of their rooms. 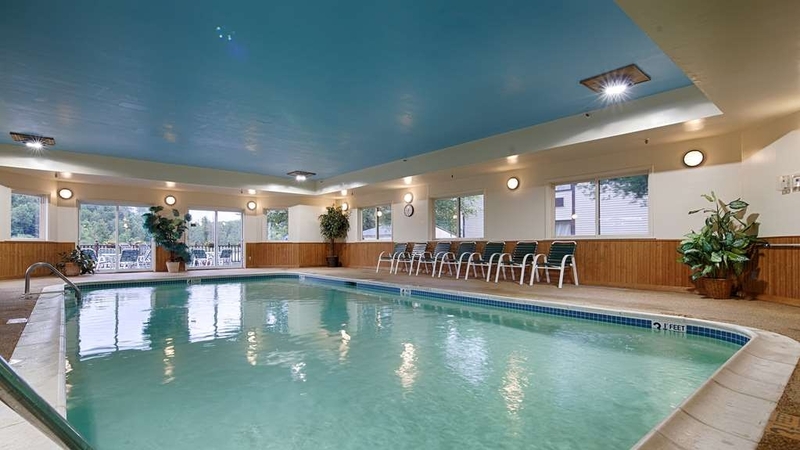 The family has also enjoyed the indoor pool on a number of occasions. A good place to stay in Saranac Lake. "Outstanding Staff Service & Great Breakfast"
The location is excellent and the staff could not have been more helpful and accommodating. The best part of the stay was the hotel restaurant next door. The bacon was thick and outstanding and my wife loved the oreo waffles. Always a enjoyable time when I stay at the Best Western in Saranac Lake. The place is wonderful, relaxing, beautiful town and very friendly people. The hotel is clean, quiet and close to any and all activities you would want to keep you and your family entertained. They are also a pet friendly hotel. "Worst hotel I ever stayed at!" Bathroom was dirty, tub had been busted and a rubber mat stuck down, so when standing, you stood on the bumpy broken tub under it. Tub was dirty, with build up of scum, and black mildew around the rubber mat. Floor had been mopped and dirt just pushed into the corner. There was dust on the alarm clock, and the heater was so loud that my husband had to shut it off in order to get some sleep, even though it was only in the 20's outside. We chose that hotel because I was in the hospital and it was close by. But it would have been better to drive an extra 10 minutes to Lake Placid and get a different place, especially since a hotel in Lake Placid gave a better discount for hospital families/patients. "Probably best choice in the winter/early spring"
Stayed one night at this hotel. Place looked fairly empty but that's probably due to being in March. Waited a bit for clerk but check in was speedy. She had good suggestions for dinner within walking distance. A decent choice in Saranac Lake. Bill at front desk was very nice. Our room was large and smelled clean. It was quiet at night. No elevator, but that wasn't a problem for a weekend stay. My only complaint was that our sheet were very wrinkled and it made me wonder if they were fresh or had been slept in before? There was no evidence of that though, they were just wrinkly. I would stay there again. Always stay in this hotel when I am in the area. You always know what type of room you will get when staying at a best western. Just wish it had a breakfast buffet in the building as opposed to the restaurant. The staff was very helpful, Location was near arena's and shopping. Easy to find on street. The staff let the team use a conference room when needed. The rooms were clean and comfortable. Overall great stay at this hotel. I apologize because I was forced to translate this comment into English from my native language. I am not a good English writer, though I am speaking very well for commercial purposes. Please accept these apologies. I visited the hotel on a business trip. I stayed here for one night. I was just annoyed that this review kept asking me to write more stuff. On the perfect so detailed is vulgar. I found this hotel to be the pinnacle of modern engineering. I will describe this hotel in great detail to my comrades. Maybe I would buy this hotel for a franchise. This hotel is very nice. I will stay here. I suggest that others stay here. Front desk person is very good. Very nice bed. Great place to sleep. 10/10 Postscript - Have you heard of Chairman Mao 's brilliant work? Read about the miracles of communism and let you once again make America great. "A bit tired and overpriced"
Both the rooms and the lobby are shopworn, the pool is small and loud. It is across a busy road from a lake but there's no easy access to it. Location is convenient but there are better options nearby. Weekend getaway with my husband, just before Thanksgiving! We decided to tour local breweries for Craft Beer tasting. Had a blast locals where friendly! Great place to go for a short vacation, lots to see! 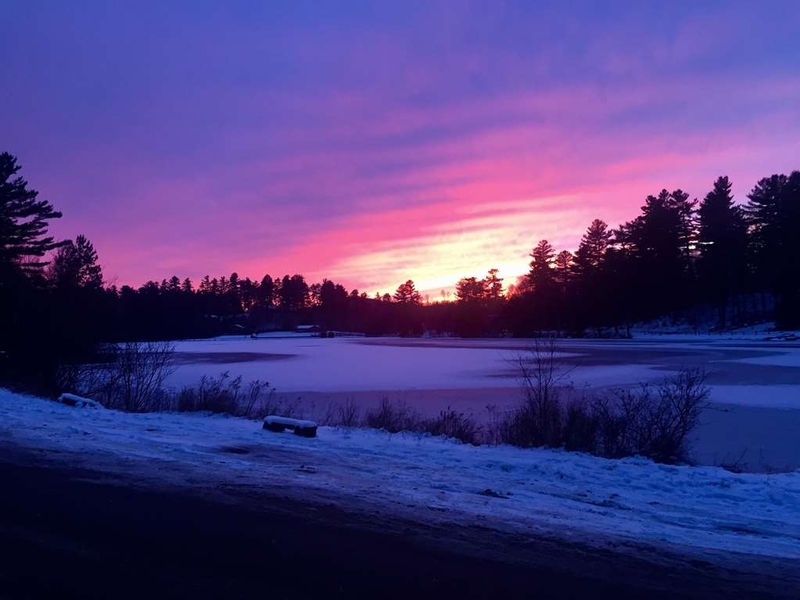 "Nice stay near Saranac Lake"
Good stay, late arrival with no problems, comfortable beds for family of 4 & easy access to breakfast in the morning. Stayed one night, but will look to return when back in the area. Affordable price made it an easy decision. Although check in and out staff was very pleasant the hotel is very dated. Found an odor that really bothered my allergies, almost like an exhaust odor. Bathroom needed updating and cleaning. Sheets looked as if they had been used although they could have been washed and not folded. Not too many places to stay in Saranac Lake otherwise my choice would have been different. Convenient location, clean and reasonably priced. I was there for work, so it was just a short stay. Friendly desk staff. I had a king room which had a nice seating area. I appreciated having a microwave and a fridge in the room, but still would have preferred some breakfast on-site. Good wifi. No complaints. This hotel was perfect for our group to stay. The rooms were very clean and the staff was very friendly and willing to help. Just a few minutes from Lake Placid and it was great! The hotel was very accommodating for our group and had a space for us to gather. Stayed at Saranac Best Western for 2 nights. Very reasonable,quiet and comfortable. 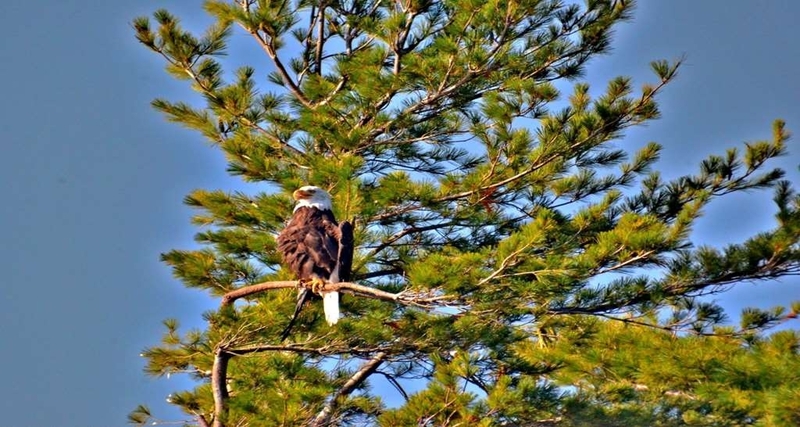 Just a few minutes from Lake Placid. Bed was comfortable, nice shower and indoor pool. I agree the only thing lacking was breakfast. I would highly recommend Blue Moon Cafe a couple blocks away, wow, cool little restaurant that serves amazing breakfast! Staff was very nice and helpful. The room was clean and roomy with comfortable beds. My sister and I were traveling around upstate NY and this was our only stay that provided a guest laundry which was most appreciated. It is wonderful to be able to wash our hiking clothes and a couple of new items we had purchased there for the cooler weather. Only thing lacking was a free breakfast. There was a restaurant next to the hotel, but I prefer the quick self serve breakfast now provided by most hotels. We also loved the location away from the crowds of Lake Placid and we loved the beauty of Saranac & Flower Lakes. A wonderful area to stay. All aspects of our stay at this location were very good. The staff was friendly, outdoor and inside appearance was very good. Pool was nicely maintained. Food was good. Rooms were clean. Area was beautiful in the fall. Hotel was clean and updated. Staff was friendly and knowledgeable. The breakfast was perfect for what I desired to have and convenient even though the restaurant is outside. I had a very good experience and would stay at this hotel again if I do return to the area. "no smoking inside; lots outside"
This motel had a great location with several restaurants in walking distance. The staff was polite and efficient. The internet was slow when guests were abundant. There was no smoking inside but too many smokers by outside entrance- had to "wade through" smoke to get inside. Stayed one night on our way home and we were very impressed with the hotels Helpful staff, nice touch of fresh fruit in lobby and free newspaper. Room was clean and Quiet. The gentleman on the front desk went out of his way to suggest restaurants for Dinner etc and they have a very good breakfast/lunch restaurant right beside the hotel. "Our second floor room was QCC - quiet, clean and comfortable"
We stayed here for 2 nights in second floor 2 queen room in early October. I really have no complaints. The room was quite good, bathroom was small but functional, pool was fine. Small fridge and microwave. There was ice and vending machines around. the desk offered complimentary news papers, and apples :). No elevator, but going up the stairs to the 2nd floor was no problem. We had a good value, ad we were only 10-15 minutes from Lake Placid. Restaurant was only a few feet from the lobby, served breakfast and lunch, and gave a discount for hotel guests. I would definitely stay here again. Quiet, clean, washer and dryer on each floor; free apples and newspaper at the desk. microwaves and refrigerators in each room. Each room has hair dryers and cream rinse. Updated decor and comfortable beds. Seems to be well-run by the managers. Would definitely recommend to other tra would definitely recommend to other trap veers. Stayed 6 nights while hiking Adirondacks. It was a very nice hotel to come back to after a full day on the trails. There was a grocery store across the street and even though the main street runs in front of hotel it was very quiet and I slept well. Only drawback no free breakfast though it was discounted at restaurant next door. NIce pool and outside sitting area. I would stay here again. It was clean and comfortable. Kids loved the pool! Staff are friendly and gave some suggestions of places to eat nearby. Has Wi-Fi and cable. Parking is convenient and there are multiple entrances so you can park near your room. We will be back. We've stayed here several times over the past year since our child goes to college in the area. We've never had a bad experience. We've found the staff to be very polite and helpful, the rooms and common areas to be clean and comfortable. Each time was very peaceful and quiet. Right at the edge of the village within close distance to many food establishments. Not only was our rest amazing there is a swimming pool to help you relax as well as exercise. The staff were most helpful in directing us to interesting area experiences and they had apples for our snacking pleasure. "Fine hotel but the ones across the way looked more interesting"
It was late at night and we were too tired to drive around. Found this on Priceline. When we got to it we realized there were other hotels on the water that may have been more interesting- right across the street. Otherwise it was fine. Clean, in good shape. Extremely quiet. Beds comfortable. No coffee in lobby but I got some from the restaurant across the parking lot. Stayed at the Best Western in Saranac Lake NY. It was very clean and comfortable and the rate was very reasonable. We didn't use the pool, but maybe next time we will! The people at the desk were very helpful. Because I hail from Saranac Lake, I prefer to stay in town rather than in Lake Placid, where the selection of hotels is far superior. 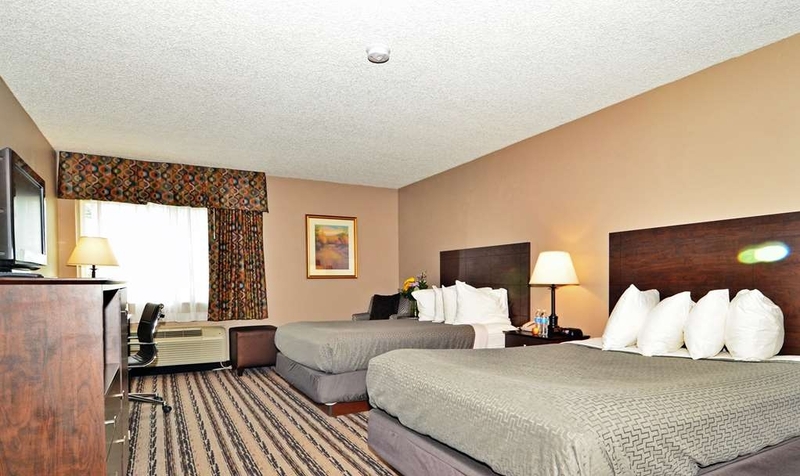 The Mountain Lake Best Western Inn, the only chain offered in town, is in an ideal location. It is on Lake Flower, minutes from the town center, on the edge of town with easy access to restaurants, et al. It could be fabulous. 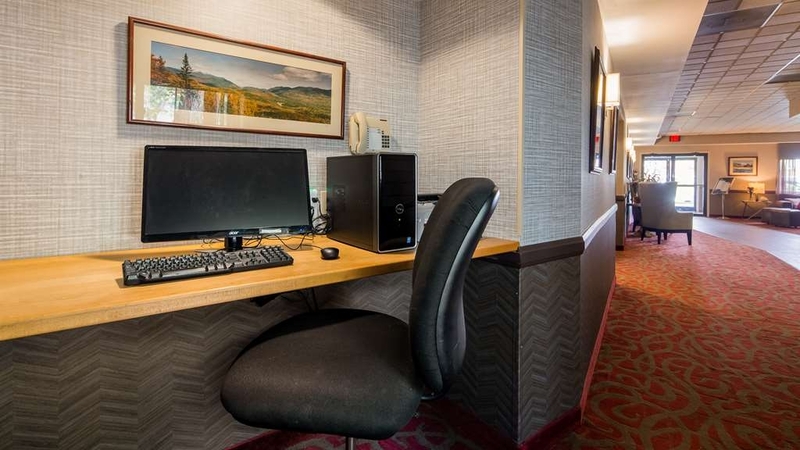 I feel guilty staying in a chain when I am in town, but the business is hard on locals, so the family run hotels offer less quality of life things like television and internet connectivity, which can be important to my family members. 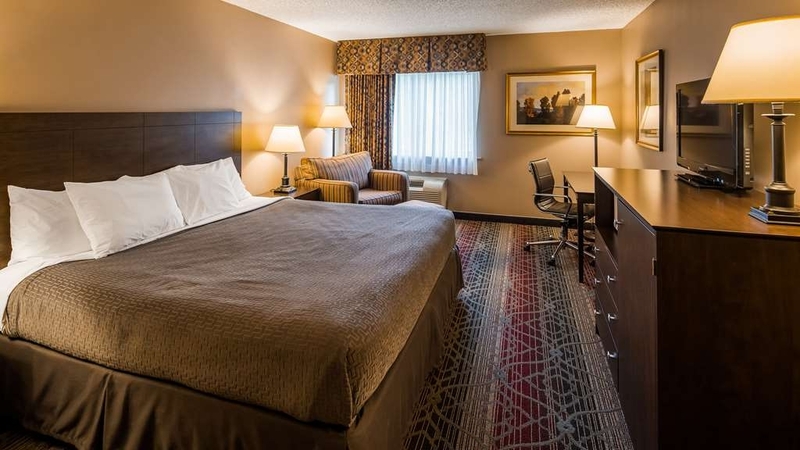 Further being a part of the Best Western chain renders the place convenient, allowing it to offer price breaks like AARP discounts and cable television, which make it desirable. However, it is not as well maintained as other BW properties I have stayed in. The beds are lumpy, the pillows are hard and uncomfortable. Worst of all, the hotel uses PLASTIC for its bathroom and coffee service accoutrements; plastic in the Adirondack Mountains seems like an affront. I know from living there that life is hard in the ADKS; the hotel business is expensive, gruelling, relentlessly exacting. But perhaps this hotel needs more support from BW. Still, what it lacks in charm and comfort, it makes up for in location and convenience. This was a nice clean place to stay the 3rd leg of the Adirondack 90miler. It's less than a mile from the finish line. Free fruit and newspapers at the front desk. Great water pressure in the shower too!!! Many places to eat within walking distance or a short drive. We stayed here while on a visit to Saranac Lake to ride the Rail Explorers Rail Cars. It's a standard chain hotel room. Very clean and quiet the entire weekend, despite being fully booked with several wedding groups there. Located on western edge of town - there is a sidewalk if you want to walk into town (maybe a 1/2 -3/4 mile walk). 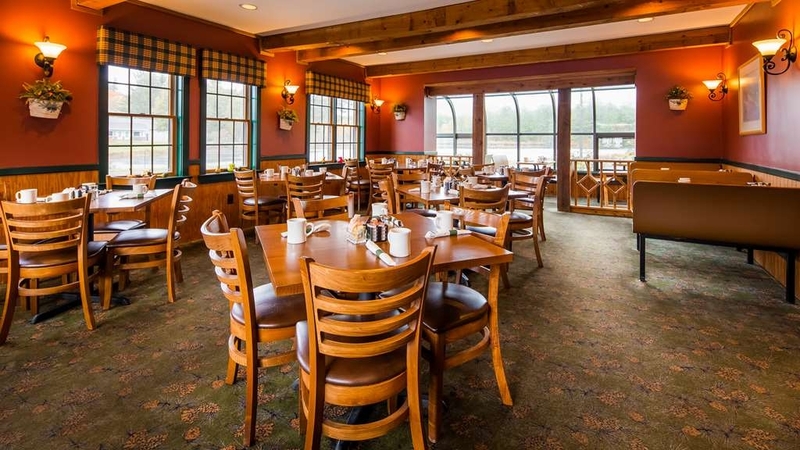 There are several restaurants right around the hotel, so you can easily walk to those, although crossing the highway can be a challenge at certain times as it is a major thoroughfare into Saranac Lake. My only negatives are towels were a little rough, and the in-room coffee maker set-ups were only coffee, no tea included. Staff was friendly and front desk staff were very informative as to restaurants and attractions. There is no restaurant in the hotel but a small place immediately next door serves breakfast and lunch, with a 10% discount for hotel guests. Very popular spot, fills up quickly. "This place has gone downhill since our last visit!" We had been here twice in 2007 so I was confident we we're booking a good place to stay in Saranac Lake where hotel chains are scarce. The minute we walked into our room, it was bad! It smelled horribly musty. I'm allergic to mold, so within 15 mins my throat & chest were tight. I needed to get out! My husband went to the desk & explained. No problem. They moved us across the hall. Not great but better. The rooms are dark & dingy. The room we moved to had no cups, yet there was a coffee maker. What were we supposed to drink from? We both sat on the end of the bed & the mattress popped up in the air at the other end. The pipe under the sink was wrapped in duct tape & a foil tape! I was actually afraid to get in bed, but I did sleep well. The front desk staff was very nice, but I don't think we will stay there again. Another couple a few doors down said their room was fine. If you stay here, definitely do not stay in room 106 or 107. "Great experience in a wonderful location"
Last minute family jaunt resulted in a great stay, great dining recommendation, and no complaints whatsoever. Grounds are maintained, rooms appropriately modern...Hotel Impossible guy would have nothing do. "Best Western Mountain Lake Inn"
Stayed at the Best Western Mountain Lake Inn for several nights in August. Our room was very clean and comfortable, equipped with a microwave and refrigerator. The staff was very friendly, accommodating and helpful. Would definitely recommend staying here and hope to come back in the future. This hotel is always clean and the staff is courteous. I've stayed here on four different occasions now and will continue to use this hotel when in the Saranac Lake area. It's a beautiful area and the hotel seems to be a popular place. There is no inside restaurant but the place next door offers 10% discount on meals. A great place to stay! Hotel is in nice location, easy access, had several issue while we were there, only partially resolved. Restaurant across parking lot only open for breakfast and lunch. Pool was cold. Room was clean, bed were firm. For area was average at best overall. If booking in the summer, book ahead. Hotel was full and saw guests turned away. Worth booking in Saranac Lake instead of placid due to price. We booked last minute and got a road facing king bed the first night which was great. Room is large enough for couple and microwave and fridge was good. Old style coffee maker and limitied toiletries in room (1 for 2 people). Room was clean and stay was nice. Front desk was friendly. We came back on the 3rd night of our trip and only room we could book beforehand was 2 queens with interior view. Room faced directly to back of pool area and we could not open our windows due to noise from hotel's large air conditioner. Room was not as updated as exterior room and need some replacements (molding around floor tile in bathroom). Looked more used. Room was clean though but again toiletries were minimal. Overall worth the stay. "Great location and all we needed." Very nice on the phone and accommodating. Check in was quick and easy. We requested a roll away and it was in the room, ready to unfold. We had 2 adults, 3 children and we were comfortable for the three nights we were there. It was quiet so it must be well insulated. 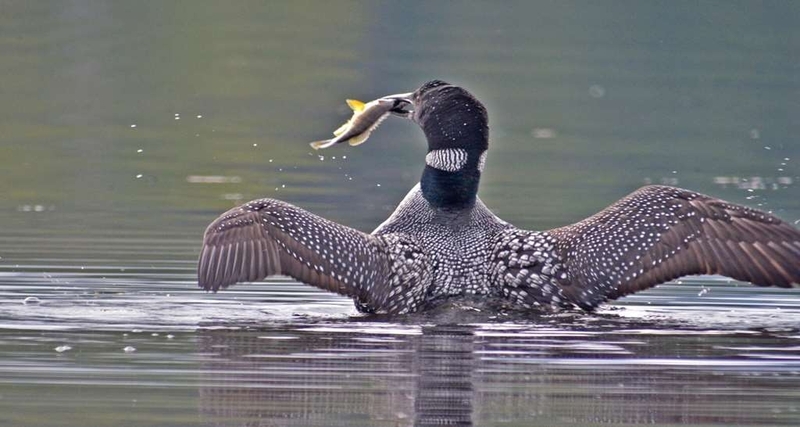 It was within walking distance of at least 4 restaurants and an easy drive to the Wild Center in Tupper Lake, our ultimate destination. McKenzie's Restaurant was across the parking lot but I wish they had served breakfast at the motel like so many do. It's easier with kids and not so much to eat. Our only issue was that the carpet smelled a bit musty but overall it was clean and very well kept. I have stayed in many best western hotels over the years and this rates at the top. clean organized and a wonderful location. the only negatives I could come up with are that they had no breakfast in hotel, even though they have a restaurant on the property, they should have had coffee in lobby. also no king beds in pet friendly rooms, although the cleanliness of room made up for that. 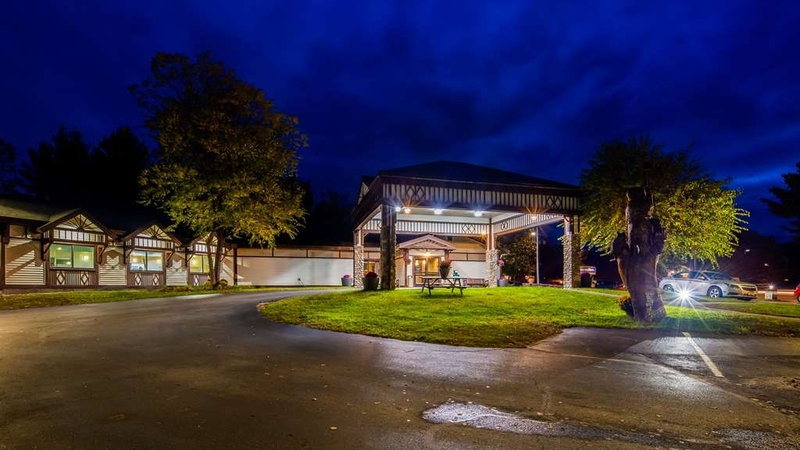 "Simple Rooms, Great Central Location"
This older hotel provides clean rooms, comfortable beds, and a central location to both Saranac Lake, NY and the Lake Placid area, without staying in the crowded Lake Placid Area, Just 8 miles from Lake Placid. The water temperature and pressure in has a damp towel type of smell, while my husband said something had been burned and the odor of cleaning agents was blended into the odor. the personal hair dryer that I packed would not work in the bathroom receptacle, It is appx, one year old, the hair dryer. I then plugged it into an outlet by the floor lamp which appeared darkened, this was a mistake. A large spark emerged through my hair dryer. That was the death of my ceramic hair dryer. Thankful that I was not hurt. Overall, we liked the room and the location of the hotel as well as the staff. Not thrilled about the hair dryer, it was a Conair that was just under one year old. It was 1875 Watts, more powerful than the ones most hotels provide. Guess I will from this point on listen to my husband and not pack my personal hair dryer again when we travel. No breakfast provided, restaurant a few steps away operates until 2 P.M. never got an opportunity to try the restaurant. They offer free apples and the pool is decent. The hotel is clean and lovely. We were comfortable. The staff were friendly and helpful. Plenty of parking. The rate we paid was quite high, and was higher than advertised on website. It did not include breakfast. But this is a very nice place to stay and we would recommend it. When I first pulled in I was a bit nervous. the roof was all beat up, the carpet seemed old, there was this weird scummy pond next door, and it just looked outdated. When we go in it was clean and comfortable though. The staff was nice too. Take note though, they are pet friendly. So dogs and such in some of the rooms. Make sure you get a room away from the pet friendly rooms if that bothers you. 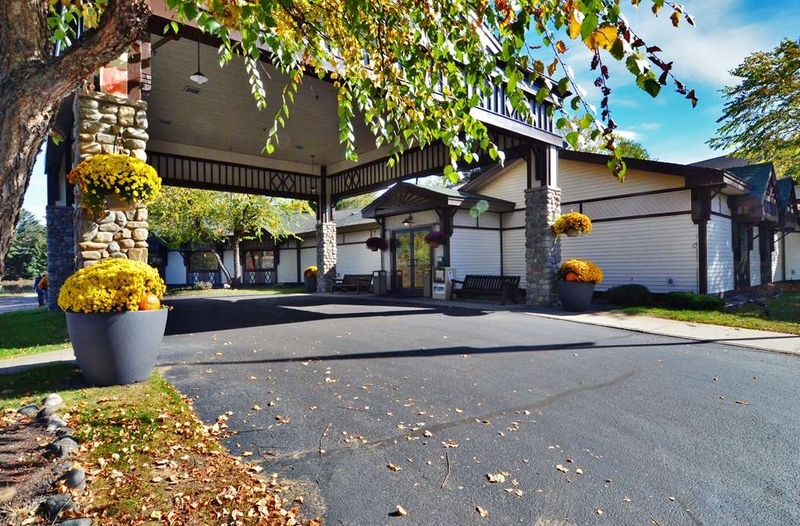 "Poor place for a best western facility"
Recently traveled with my elderly parents to Saranac Lake and had made reservations here for a handicap room and a joing room or a room close so that we could assist them. They were given a first floor room and us a second floor ?? When we expressed our displeasure the front desk lady said there was nothing she could do about it... It's not a very handicap friendly place, no automatic door buttons, and very heavy doors, now it's a little hard to open a door and hold it open while sitting in a wheelchair... Hallways are dim. Stayed for one night with friends. Hotel is older but well maintained. Pool is indoor and nice. Staff is very friendly. Room was very clean and large. Since it is in a tourist area the price is not cheap but I think it was a good deal. This area is beautiful and great for boating and hiking. The restaurants we visited were good. The Mexican restaurant was busy but good. We stopped at Tail of the Pup on the way in to Saranac Lake and had a good lunch. Both restaurants were reasonably priced. It was a great getaway. The people were nice...best I can say. This place was very dated. The hallways were dark, the rooms likewise. No patios or balconies. The grounds lacked any charm, gardens, or curb appeal. It's a 2-story property with no elevator. Our room was adequate...that's all. No chair other than the desk chair. Bath was small, narrow tub, no toiletries beyond soap and shampoo. Lobby had zero appeal...no place to sit or read or enjoy a common space. Very small deck off the small indoor pool offered a few seats. This hotel is "pet friendly" so we dealt with guests with large dogs walking them outside our room with the accompanying barking which was disruptive. In room coffee and a bowl of apples at the front desk was the extent of the food options. An adjacent restaurant was an excellent breakfast choice and they did offer a 10% discount to hotel guests. There aren't a lot of "name brand" hotels in Saranac Lake and all the accommodations in the area looked "old". We had tried to stay in Lake Placed (8 miles away) but the costs were either outrageous or there was no availability for our dates. Again, I would say the people were nice...everyone at the desk was helpful with whatever we asked. But that doesn't make up for the lack of comforts at what is a old property. We were in Saranac Lake for the 43rd Can/Am Rugby Tournament and while we have traveled a lot with rugby groups, we still appreciate a quiet hotel. We were pleasantly surprised by this one. The decor of the hotel is a bit tired, but overall it was clean and the employees were nice. The air conditioner was a little loud, but it worked well. Arrived for 3 days/2nites to have some fun in the area. Hotel has a great view - across the street from Lake Flower. Check-in was smooth. No elevator, so keep that in mind. Our room was on the second floor. The hallways had a funky smell, not bad, just old I guess. But the hotel was very clean, as was our room. Beds were very comfortable, a/c worked great! In the room there was a coffee pot, microwave, and fridge. Wi-Fi worked great and easy to log into. Had an indoor pool which our 7 yr old enjoyed, and a little outdoor deck off of the pool which was nice to sit on. There were a lot of people staying here (rugby tourney in town, and lacrosse tourney), but we never heard anyone get crazy loud. Hotel staff was very friendly and always smiling. In fact everyone in the town was nice, which I really appreciate, coming from an area where everyone's always grumpy and mad lol. We went to MacKenzies for breakfast one day (next door, very yummy food and friendly staff again), and went to Casa del Sol (next door on the other side) for dinner (and enjoyed that as well). I would definitely come back and stay at this hotel. Very good on all counts. It was a clean, quiet hotel and met all of my expectations and needs. 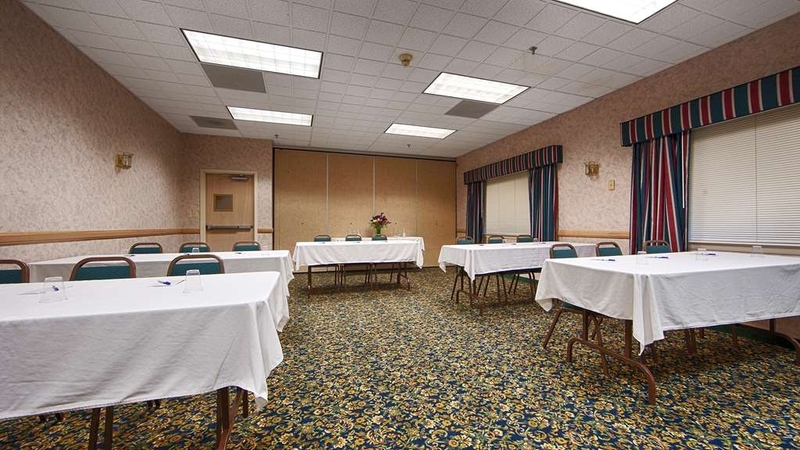 This hotel offered a wonderful location that is close to local services and in close proximity to downtown. We paid almost $200 per night for a room. Pets were allowed in the hotel room but not allowed at check in or anywhere else in the hotel. We felt like the hotel was pet-tolerant but not particularly pet-friendly. The room was a non-smoking room and smelled like smoke which was a disappointment. Things were out-dated. Not a big deal but not what I would expect for $200 a night. Staff were all incredibly friendly and helpful and it was a convenient, pretty location. Walking distance to restaurants and the lake. "Friendly staff and cheaper than Lake Placid"
I stayed here in September 2015 for a couple of nights (before and after a long day hike of Mount Marcy). As some other reviewers have noted, it is a bit older and could probably use some updates. But the staff were extremely friendly and helpful on a number of items (e.g. 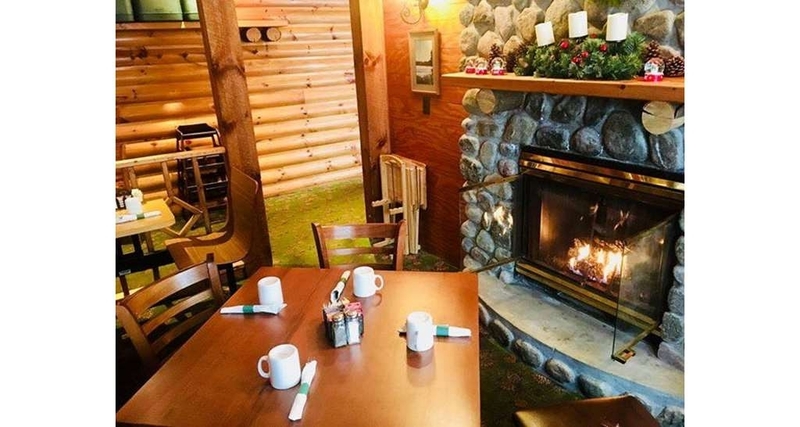 restaurant recommendations, driving directions and more) and the price was considerably cheaper than other places I checked on over at nearby Lake Placid. I was also grateful that they had a washer and dryer on site; my hiking clothes definitely needed some attention after Mount Marcy. True, there's no breakfast included, but the adjacent restaurant is decent and the discount helps. Again, still less expensive than similar hotels in the region from what I can tell. It's also walking distance from several restaurants (reviewed separately). Clean and neat but in need of upgrades in furniture and bedding. The staff is very knowledgeable in the area and attractions for all age groups. The hotel location is functional and close to many attractions. I would need to check the area to compare the cost value. We went to Saranac Lake to ride the rails. We were looking for a motel in the area with a recognized brand. This is in a very good location. They do not have a restaurant in the hotel but they do have one on the property that serves breakfast and lunch. It was a very nice place to eat and the staff was very friendly. We found the hotel clean and comfortable. The staff was very friendly. They have a indoor pool but we did not use it. I would stay there again if in the area. We have stayed here before and returned here as we were going to be visiting friends and family. Easier this time to stay in a motel/hotel than with anyone. Next trip to Saranac Lake and we d stay here. It's an old hotel, clean and quiet, with a nice, clean swimming pool. They do not provide breakfast, but there is a 10% discount at McKenzue's Grille, just across the parking lot. There was no coffee machine in the lobby. 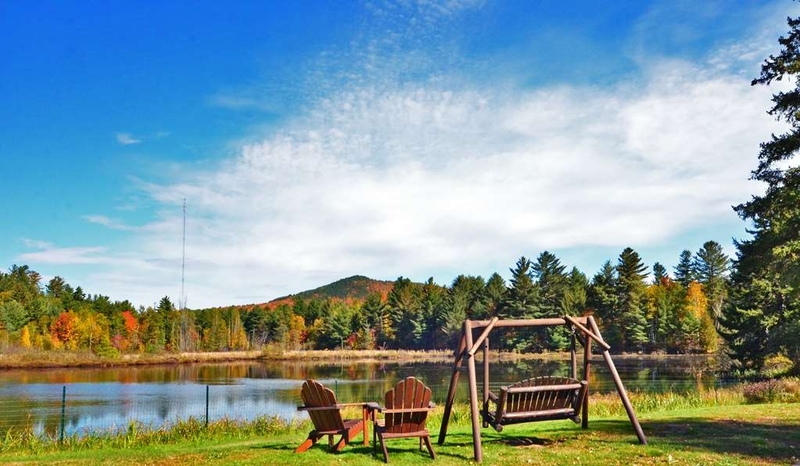 At $130/nite, it was centrally located and reasonably priced for the Adirondacks in July. As usual, the Mountain Lake BEST WESTERN is like a vacation home. 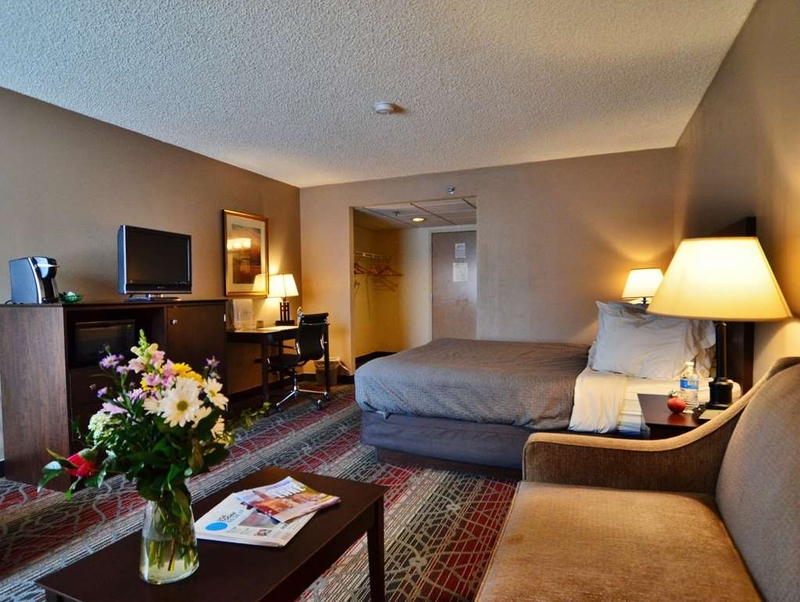 Friendly, clean and comfortable, close to good dining, pet friendly, and beautifully located. We always stay here when in the area, several times per year. Our pet was allowed to stay, and go hiking and kayaking with us. We boarded our small dog for the day at Lakeside Veterinary Clinic while visiting the Wild Center. Very helpful, pleasant experience! It is much easier to take an active Yorkie along with us, for pets need fresh air, exercise as well. It is only natural to not be nature deficit! Get out and enjoy what the great earth has to offer in its beauty! "WORST WESTERN, certainly not BEST WESTERN"
This hotel is old and showing it's age the lobby is dark and feels dirty. The hotel does not offer any breakfast (not even a coffee in the lobby) the wi-fi is so bad I used my phone as a hot spot all evening. I would not stay hear and I would not recommend this hotel. It feels like you are staying in one of the very low chains. NEVER AGAIN. We were on the road for 14 days and this was by far the worst night we spent any where. Everyone at this motel was nice and helpful. The rooms were tired and out dated. They were dull and dark but quiet. For $200 a night I would think there would be better maintained. Door from outside at parking lot was never locked at night. "if you have other options, choose them"
The girlfriend and I stayed here during a hiking trip in the High Peaks. The staff was friendly, personable, and knowledgeable about the town/region. The price was affordable and we got the AAA discount. The hotel and rooms were well maintained and very clean. Zero complaints. The location is within walking distance to everything in town; there are several restaurants and liquor store adjacent to the hotel. We ultimately decided to stay an additional night and will be returning in August during our next trip. "Non existent internet and poor customer service"
First off I apologise for the length of this review, but I have a lot to say! We stayed here for four nights and chose this hotel as it was the best rated in the Saranac Lake area and at $90 per night seemed good value, especially compared to the nearby Lake Placid area. 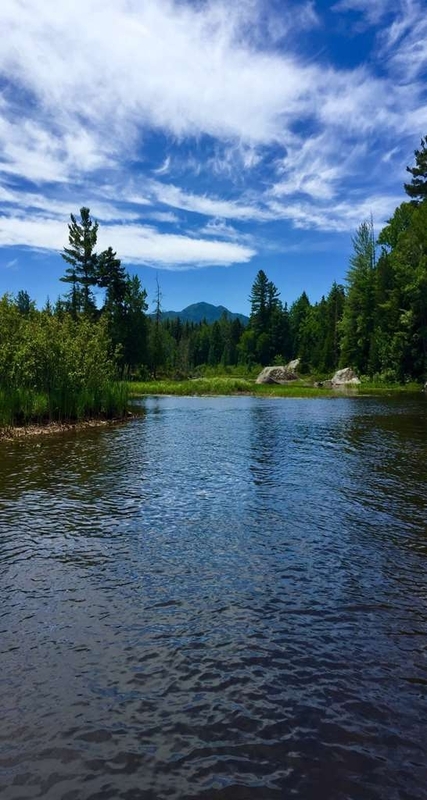 First off the location is excellent as Saranac Lake provides a great location to explore the general Adirondacks area which is what we wanted to do. It was easy to find and the hotel itself is located next to a small lake and opposite a larger one, so nice surroundings. My initial reaction when checking in was good as I was greeted in a friendly manner by the man on the desk and when I asked if any of the rooms had a lake view he said that none had a direct view but he would give us a room that had a partial view. We were directed to drive round to the back of the hotel and enter in the rear door. There are only two floors at the hotel and we requested the top floor with a king bed and sofa which is exactly what we got. The room was a good size and appeared clean. We had a small round table with two chairs, a sofa, king bed with side drawers and a flat screen TV was located in front of the bed on top of a set of drawers which also housed a microwave and a small fridge. The wardrobe area was open and located in the entrance way. The downside was the bathroom which was very small and very tired and dowdy looking. The bath and toilet were a strange yellowing colour, almost like the colour of ceilings where people have been smoking for years. It was clean, but really needs modernising and making larger. Definitely the smallest bathroom we have had in a hotel. Another annoying thing was that we had a king size bed, but were supplied with six very small pillows of which you needed four to fit across the width of the bed. How is anyone meant to sleep on such tiny pillows which your head falls between during the night? On our first evening we tried to connect to the internet and it was very slow, but as we weren't too bothered that night we didn't think too much of it. However the following evening we could barely connect and it took forever to download just a few emails. When we checked the speed it was 0.8MB which is definitely not high speed as advertised. We tried again an hour or so later and it was 0.5MB, so we asked at reception if there was a problem and was told no, they had the fastest internet available from Time Warner and if we had a problem we should call them ourselves. We were a little put off by this as it is not our job to contact the hotels internet provider if there is a problem. The next day once again we could not get any decent speed (0.2MB) and went down to reception to complain. My husband was told to phone Time Warner as sometimes TW ask the hotel to reboot servers etc if there is a problem. We asked if they could do that anyway as we were having major problems but were told we would have to contact TW and if they thought there was a need they would then contact the hotel and advise them what to do. As a guest of the hotel, I do not feel it is us who should be contacting internet providers on behalf of the hotel. If the shower stopped working would we be expected to call a plumber? The customer service from two different employees over this same issue was a disgrace. If a hotel advertises high speed internet then that is exactly what it should be - not dial-up! Pros: Location Comfortable bed Microwave & fridge in room TV with free on demand channels Large room Great restaurant next door Cons: Appalling internet Poor customer service Stupid pillow sizes Bathroom very small & tired looking As this was our first experience of Best Western, it doesn't bode well and this could well be our last stay with this brand. "Great place, but really not really handicap accessiable." 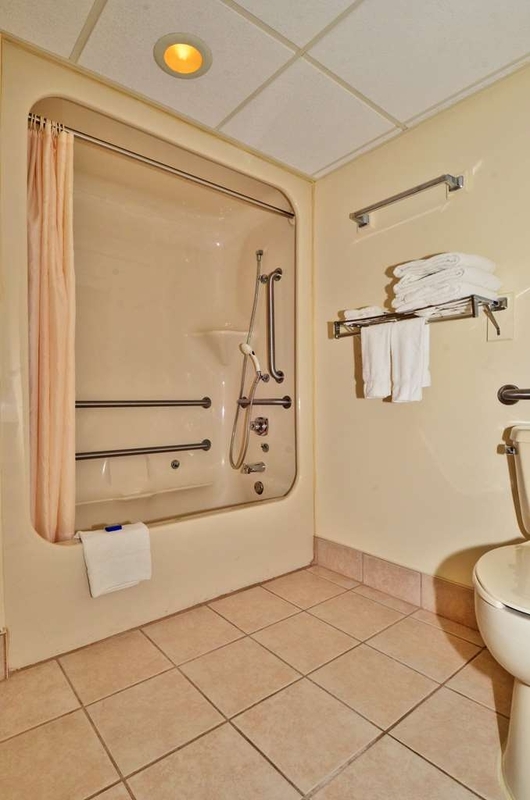 If you are confined to a wheelchair, the ADA rooms do not have a roll in shower. The back ramp that leads to the ADA rooms has a big crack in the concrete, all the way across, that a wheelchair could get stuck in. Other then those things, which the shower did not effect me because I am able to get out of the wheelchair and stand for a few moments, the stay was great. Rooms very clean and bed VERY comfortable. Restaurant out front of the hotel had great breakfast and a discount if you showed them your room key. Would stay here again. "Cost Effective, clean, great service, HOG friendly"
Stayed one night on a bike (HD) trip through the area. Staff was genuinely concerned with how our trip had been and if we needed anything, suggested the BLUE LINE Brewery nearby which was a great dinner option. At $98/night fro two Q's it is a great place to stay. "Great value for area-HOG riders"
Given the choices in the area this BW was a good value. Stopped one night on motorcycle (HD) road trip. Loved the Adirondack chairs facing the mountain. Nearby is a brand new start up microbrewery (Blue Line) that merits a visit- always try to support local entrepreneurs. Staff was genuine in asking us about out trip and needs. Only drawback-no hot tub. "best western Saranac lake ny"
"I inconvenienced a staff member"
The stay was good and the rooms were nice. When I arrived home I realized I left my pillow. I called that night, after midnight and there was no answer although I let it ring for quite a while. I called the next day, Friday 6/3 at 11:15am, and a man answered. It wasn't the most polite greeting in the world, which is unusual to me since I work at a hotel. I thought polite greetings were industry standard by now, especially by morning desk staff. I told the man that I had just checked out the day before and had left my pillow. After a pause of silence followed by a long impatient breath, the man said with a bit of disgust, "For the life of me, I can't understand why people bring pillows to a hotel." This was said as if I wasn't there. He had to be joking and I waited for the punch line, but there was none. I said, “I'm not sure why other people bring pillows, but I have a neck problem and can't sleep without it.” There was silence again. So I said, “It's not the hotel pillows are bad, it's just that I can't rely on the type of pillows they are.” There was nothing but silence again. So I said, “I was in room 216. Has anyone seen it?” There was a pause again, and then as if he was being inconvenienced, “Let me look in lost and found.” He didn't say please hold or I'll be back in a minute. He just put the phone down. After a few moments he picked the phone up and simply said, “It's here.” Then he didn't say anything. I guess he was hoping I'd say, “Good! That's all I wanted to know. Thank you!”, and then let him back to whatever he was doing. Obviously the pillow was important to me. Common sense and courtesy would have been for him to offer to ship it or at least to figure out what I wanted to do with it. Nothing was said, so I broke the silence again by saying, “Ok…..I would be glad to pay the shipping to get it back.” This time, he said immediately, impatiently and miserably, again like he was talking to himself, "If I had a nickel for every pillow I had to send back..." At this point I realized this was not a happy guy and I just wanted to get this done. I said, “I have the credit card.” He signed loudly and mumbled something while he got a pen and paper. He said, "Number?" I read the number and he read it back like it was the hardest work he did all day. He said, “I have an address here.” I said that it would have to be mailed to a different address than he had. There was grumbling again. Then he said loudly, “Address?” I guessed that meant he wanted me to give it to him so I gave him the street address and waited for him to repeat it or ask for the city. He said nothing, so I gave the city, paused, state, paused, then zip. He seemed irritated by the address. Not sure why. Maybe he didn't approve of where I live either. He begrudgingly said, “It'll be shipped.” I wasn't sure if he got the address correctly but I said "Thanks!" He said nothing, and hung up. I wasn't going to say anything at the time for fear of not getting the pillow back. I did receive it a couple days later and I thank the housekeeper for turning it in and the gentleman who returned it even though he made it very clear that I, a guest, was stupid for bringing a pillow, and inconvenienced him for paying to have him send it back. He is not doing the hotel there any favors. The hospitality business is about hospitality. Sometimes we have staff members who complain that "I could get my job done easier if it weren't for all these paying customers!" That seemed to be where this guy was at. Looking back now, it was actually sort of funny. This guy not only missed every opportunity to make a good and lasting positive impression on a guest at no cost to the hotel, but did exactly the opposite. Upon first entrance to the hotel I thought it was great, major renovations happening so that's always nice to see. The clerk who checked us in was friendly and quick. Then things went downhill from there. Our room was straight back and visible from the desk. We were met by another employee who said to us "if you were here 5 minutes ago you wouldn't have cable in your room". Seriously, you wouldn't knock on our door and ask to come in to install a box?? OK, whatever. So we got into our room after the cable guy left, we were told the carpets were just installed the day before, they looked nice. I went into the bathroom to use it, picked up the lid and it was used. Ok so that grosses me out, what else was used in my "clean" room. I went to the desk and complained someone used the bathroom and I wanted it cleaned and new towels. He told me to hold on a minute, went into the back, came out a minute later and said he'll be with me in a few minutes. So I went back to my room and waited, and waited and waited some more. My husband came in and was surprised I was still waiting after 30 minutes of waiting and decided, were out of here. Went back to the front desk told the clerk we are not staying, he said "OK, your all OK then". Not even an I'm sorry, is there anything I can do...NOTHING. Poor management on their behalf and crappy customer service. The hotel across the street is lovely. "OK but check other hotels in area as well"
This hotel (set on Lake Flower not Saranac) has a pleasant communal deck area to have a read and sunbathe. Only 8 miles from Lake Placid, so handy if you want to visit there too (the best lake to visit in my opinion and I wish I'd stayed near there). It was very noisy when I stayed, the front desk guy was already aware of the problem and did his best to sort it out and I know hotels don't know who their guests are in advance but it spoilt my stay. No breakfast included but you get a 10% at the diner in the grounds of the hotel - I tried it on my first morning and there was no wi-fi (emails and online news part of my breakfast routine!) and the food wasn't great and a tiny bit pricier than it should have been for what it was. I didn't go back second day! We have stayed here a few times and the staff is always friendly and professional. Close to Lake Placid but quiet. Hiking trails not far away. Good margaritas next door! My only issue is with the bedding. Bedspreads and decorative(?) pillows need to be tossed for sanitary reasons. Other motels have switched to duvets with washable covers-time for this one to do the same! A MUST choice if you want value for money and comfort in this beautiful area. Reception was simple and fast, the rooms were clean and comfortable and checkout was efficient. The hotel is located close to an excellent choice of restaurants and stunning lake views. "Overall, okay. Not great. " So we stayed here for a total of 3 days. The front desk stated that the beds would be queens when they were full. We had 5 people. And two beds and assumed that we would be able to share. Wrong. We got a got for an extra $15 a night. Then they called us at 11 pm when 2 people were sleeping and said that they wanted us to pay. 11 pm! Otherwise, the pool is nice but not too big and the rooms are okay. Clean and comfortable, friendly and helpful staff. The room was a good size - didn't feel cramped. Although the rooms don't really have a view, the area is pretty once you step outside. Super simple to get to Lake Placid from the hotel. The associated restaurant across the parking lot is convenient for breakfast and lunch, and has a nice atmosphere. Overall a good experience. Because of a college graduation they gouge there customers that weekend and then go back to regular prices and at the same time they are doing a renovation, not a very good way to run a business, I would never stay at a Best Western again or recommend it to anyone!!!!! 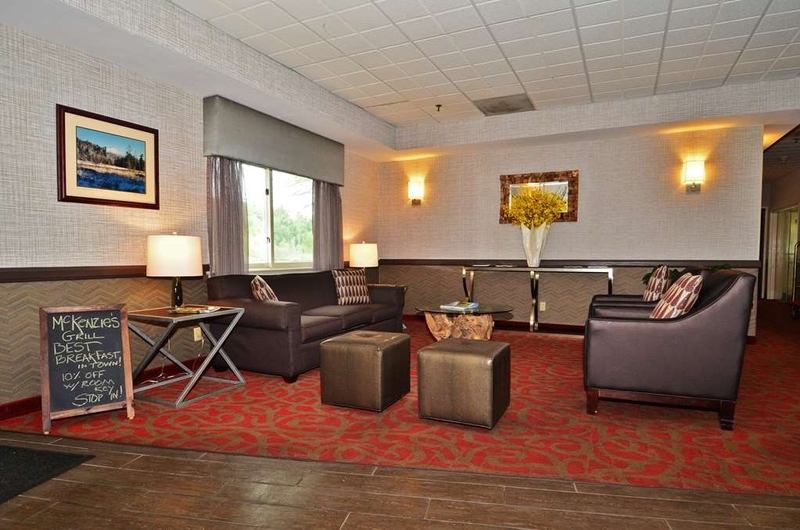 "just an ok experience, pricey for the quality"
Stayed at this Best Western for the first time. Below par compared to other BW experience and amenities. Room was of just average quality. Construction on the weekend in the morning, even on Sunday. Off season, prices were not justified for quality of property. "Hotel was okay, staff not so much..."
Stayed here for a last minute getaway this past weekend. We decided on this hotel based on it being 'pet friendly' and the rate was decent. We booked online and reserved a pet friendly room, but the day of arrival I was sure to call to confirm we had been placed in a pet friendly room. The front desk agent who answered the phone, I believe his name was Doug, did not seem to happy that I was confirming my room and informing him we did in fact have a 7lb puppy traveling with us. When we arrived, we parked and unloaded our belongings and grabbed the pup (making sure to carry her in my arms into the hotel). We entered the lobby and saw two men at the front desk. One seemed to be into the computer and paperwork and never even looked up, the other (who I believe was again Doug), was not personable or welcoming at all. He quickly informed me "pets are not allowed in public areas of the hotel!" Okay sir, well can you check me in then so I can get the ferocious 7lb puppy into my room, oh and thanks for welcoming me to your hotel. We noticed a $20 pet fee on the registration form, not that it was a big deal we were happy to pay the fee but, it was never mentioned when booking or when I called to confirm the morning of arrival. After registration we loaded our belongings back into the car since we weren't allowed to walk down the hall with the dog-and drove around the building to 'Door B' which we were told was the only enterance we could use since we had a pet. We arrived to our room, which was your typical hotel room. Clean and spacious. We didn't spend much time at the hotel-but it is conveniently located 10 miles from Lake Placid and a short distance from Downtown Saranac. Very clean and professional hotel. They do not serve a breakfast but there is a restaurant on property and a discount is offered if you are staying at the hotel. The restaurant only offers breakfast and lunch. Rooms are large and comfortable WiFi easy connect. I stayed here because my husband had surgery at the local hospital. Easy commute back and forth to hospital. 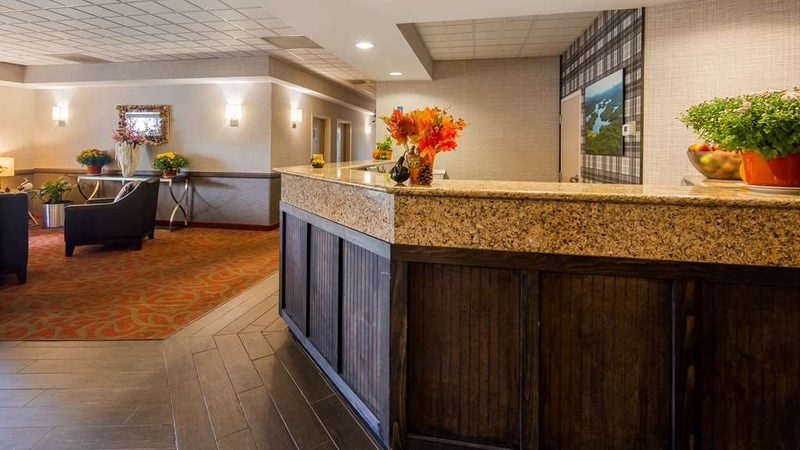 "Good for the area selections available"
Best Western Mountain Lake Inn in Saranac hotel is a clean, safe choice for a business trip. Pool available HVAC was a bit loud. No continental breakfast which is disappointing but a 10% coupon is offered for the restaurant next door. "Great Quality at affordable price"
Very clean, quiet hotel with the most comfortable bed and tons of pillows; extra blankets, too. Staff is polite and expedient with requests. I would recommend. Only thing to note is that there is no elevator, so keep in mind when making reservations if you have special needs or are traveling with very young children. Great spot! Great price, friendly staff, awesome views, clean and comfortable. Good restaurants very close by. Nice little breakfast/lunch spot on the premises that cooked a tasty breakfast. Plenty of activities if your looking for summer fun. "We had a short stay." Although we had a short stay, the facilities at this Inn were very nice. The rooms were clean and the Inn was within walking distance to several places to get food. There is a restaurant right next to the inn that serves breakfast and they give you a discount if you stay at the inn. There is a very nice view from the inn and sits right on the lake, how surprised we were to wake up to ice covering the lake that was not there the night before. The service was excellent and friendly and very accommodating. Booking on line and checking in and out was a breeze. We also enjoyed a relaxing time in the heated indoor pool. I can not fail to mention that a large bowl of fresh apples is waiting for you on the counter when you check in. We would stay here again. They do provide free WiFi. It's alright place, one of the best places to stay in town. 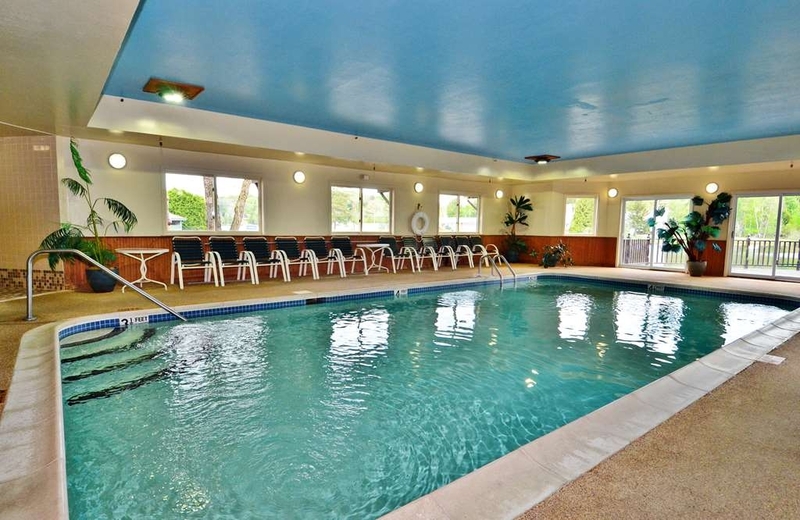 The rooms are clean , the staff are very nice there is a pool if you like to swim and let the kids have fun. Parking is right up to the building you can look out your window and keep an eye on your car. There isn't anything about this hotel that stands out as excellent but there isn't anything that stands out as poor either. This is a middle of the road hotel with middle of the road amenities, comfort and staff.....if you go there with neutral expectations, you won't be disappointed. Overall a good deal. 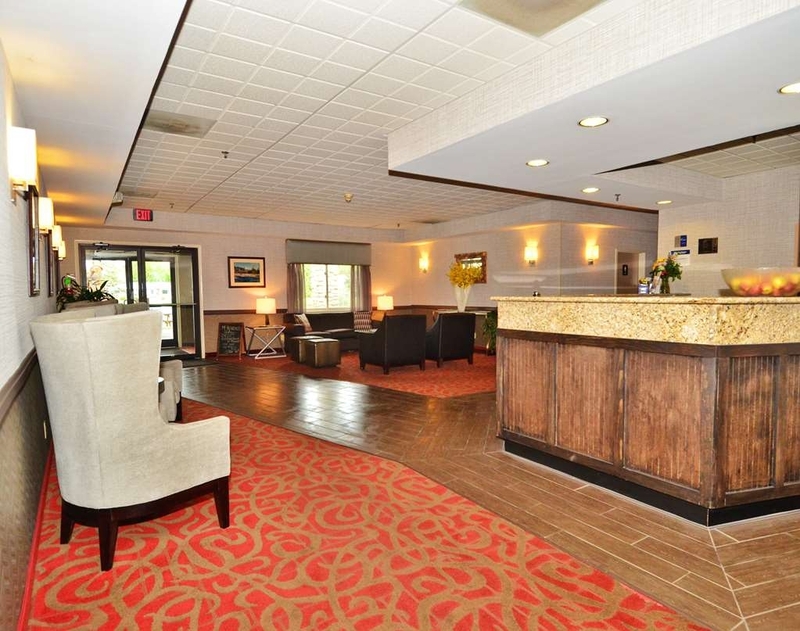 The room, lobby and hallways were clean, no disruptive hallway or outdoor noises, good heat, water and other amenities. However, the room décor was a bit tired. No coffee or breakfast items available in the hotel. You have to walk across the parking lot to their restaurant. We have eaten there on past trips and the food is good. It's close to other food establishments too. All in all, for the money the room and experience was good. We'd stay there again. Very nice and clean. Easy to find, easy to park, easy check in/check out...it all was easy! We flew into Albany and rented a car to drive up. Being a Florida winter wimp I was concerned about the weather, but the hotel had convenient parking, was easy to access from the main road and had the driveways and walkways clear. Staff was all helpful and friendly. "A 'pet friendly' hotel with a dog hater on staff"
Made the mistake of thinking a pet friendly hotel would be ok with bringing the dog in for check-in. While guests in the lobby were lining up to pet our Golden, and we were registering with a nice clerk, a manager appeared behind the counter and made an ignorant crack something like, "Good thing the owner's not here to see that: he'd kill your dog." Dogs are only allowed in and out through a rear entrance. Later I went back to the front counter looking for wine glasses, got the same guy and was told the hotel only provided plastic cups and if I needed a wine glass, I could across the street to the liquor store. Room was overpriced based on the size, furnishings and amenities. They advertised a restaurant for breakfast but it was closed for the winter. We LOVE the fact that we have a place to bring the dogs with us . . . . Swimming pool was a little chilly but very clean and nice. Fresh apples at the front desk were good. Clean room and comfortable beds. Very satisfied with our stay. We will be back. I've stayed here many times over the years. Since losing our tent platform permit to the APA in 1976, it's been hard to consider going to Saranac Lake. Once we adjusted to not having a real home away from home, though, we eventually realized we had to find something else. This turned out to be it, at least during the non-summer months. While it can be expensive on weekends, especially if something else is going on in town, it's fairly reasonable during the week. In winter I love floating in the pool and looking out at the snow and mountains through the windows. There is free wi-fi, and there's a full computer in the lobby, which helps if you need to take care of business. They offer a 10% discount at MacKenzie's grill next door with your room key, but beware - they close at 2 PM. I sleep with a pile of blankets on, and wished there had been an extra blanket in the room. The second night, though, I thought to ask, and they brought me one right away. I would choose this hotel before any others in winter, spring, or fall. Summer, I'd rather be closer to the lake. I still consider it my home away from home. We visited for a hockey tournament with family. The room was clean and beds were comfy. They have a fridge and small microwave as well as a 1cup coffee machine in the rooms. The room was surprisingly spacious. The staff was very helpful and informative upon arrival. Free news paper and apples were available at all times. I have to say though, I would have preferred coffee in the lobby instead. They also offer free wifi. The pool room was small but clean and on another weekend probably a nice winter treat. We as I said were there for a hockey tournament and the place was loaded with kids and extremely loud. I imagine that most times it is very quiet. The staff really was accommodating to the teams as the conference rooms were used as team dinner spaces and a place to hang out when the hallway was not quite enough. On another note the room could use a bit of updating. The bathroom is very small and the tiled floor needs a good grout scrub. There was also a yellow staining on the bottom of the tub. It was clean but stained. All and all a decent weekend stay especially if you have kids and need a reasonable price. Best Western in Saranac Lake is a great place to stay. It is by the lake. The staff is very friendly. The rooms are Large and clean. We stayed in a king room and the bed was very comfortable, it had 6 pillows on the bed for those liking extra pillows when you sleep. The internet was fast. There is an indoor pool also and a restaurant on the next door. I would definitely stay there again. Very comfortable rooms, indoor pool, good restaurant for breakfast, free wifi and an affordable price, especially for this area. Highly recommend this hotel. It is conveniently located to downtown Saranac lake, though the only downside is that it is a bit of a long walk to downtown, so you might want to drive. 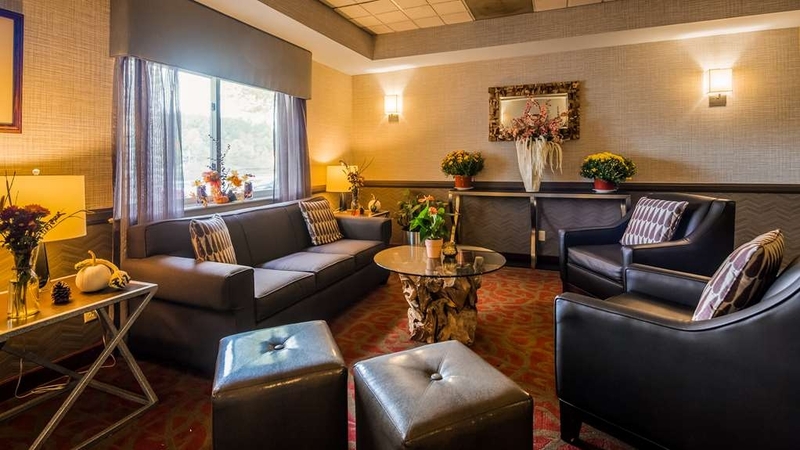 "Best Plan 'B' when necessary"
Staying over the New Years week we choose the Best Western over other Lake Placid region locations more for its amenities and overall cost. 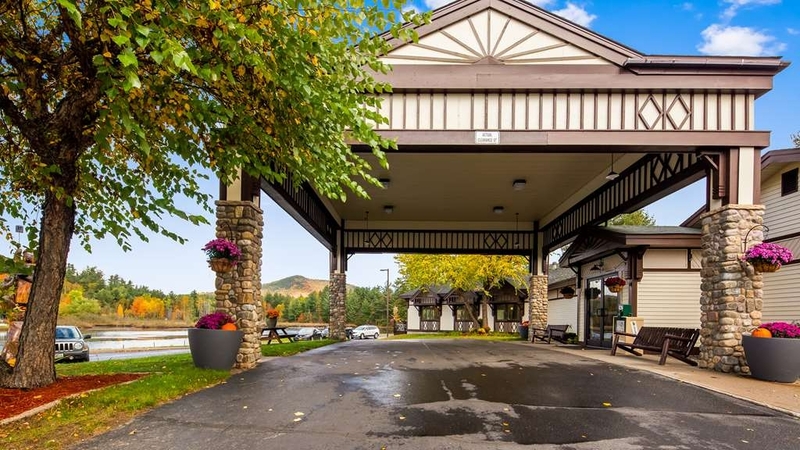 Located only 10 minutes outside of Lake Placid the hotels location provides a nice ‘out of the hustle and bustle' quiet atmosphere. Kudos to the state highway department in keeping all the roads nice and clear during the first snow fall, going back and forth between Saranac Lake and Lake Placid was very pleasant and easy to drive. Surprisingly, the hotel did a pass with a plow on the property roadways however they remained covered during out stay and somewhat hazardous for folks whom have challenges walking on packed powered snow. We never really interacted with the hotel staff (no interactions means things are working well), however the ones we did have a pleasant attitude. Free WiFi worked flawlessly and fast. Major plus. The hotel itself did show some dated wear but overall a very clean hotel. As other reviews have stated, it is a walk up two story hotel. There are several access stairways but a walk up regardless. Our rooms heater seem to have been idle for some time as when we started it you could smell the rawness odor that comes when you first turn on electrical heating unit. The fan also ran continuously even though the switch was on auto. The bathroom was probably not the best I've seen but again, always kept very clean by housekeeping. The bathroom did not have any heat lamp or fan. The drop ceiling along with a step up shower made it very easy for the shortest of people, (5 foot 8 in) to easily hit the ceiling with their hand. Anyone six feet or taller will have challenges in the shower especially since the shower head is ‘fixed' and cannot be adjusted. Having limited counter space because of the sink and coffee maker limited your space. And since there's only one table in the room, again limited your storage space. There was a lot of talk about ‘lake view' rooms. There are only a few, (less than 5) in the whole hotel so don't get high expectations on getting one when you book. Most of the views are just of the parking lot. The indoor pool is only 4+ft in depth so it's not a jump or dive in pool. They keep the area very clean and heated so it is a good amenity to have. No restaurant on-prem however there's a Breakfast/lunch “McKenzie's” next door with a 10% discount for guest. Another good amenity to have. 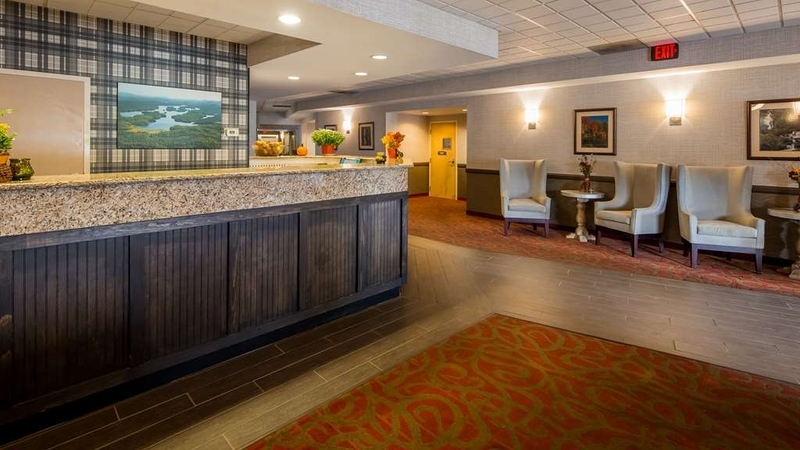 Unless you have specific requirements to stay in Saranac Lake, the Best Western is a great ‘plan-b' option for its value and close proximity to Lake Placid. "Old & worn out - rude desk "
Never again. Staff at desk very rude. Staff unplugs fridge daily when cleaning so all food and medications get destroyed Tons of hairs and lint on bed and floors. No fan in bathroom. Moldy. Tub yellow with permanent ring. No elevator and I was disabled. Desk staff refused to help me bring items up stairs. I had to crawl up stairs on my knees to get to room. Horrible place. "Ideal for exploring the Saran Lake with the kids"
Stayed there for 3 days with kids on weekdays, so the hotel was not crowded as during weekends. Very welcoming staff. 2 Queen bedroom was very spacious. Large pool with the right amount of chlore and very warm water. We felt we had the hotel to ourself. The only thing missing is a jacuzzi beside the pool, Overall, very good ratio quality price! Staff very good & helpful, restaurants close, the beds very comfortable. Exterior & lobby updated nicely, rooms need updating. Bathroom had signs of mold, the towels rough & thin, room heater noisy thru the night. This is the only hotel in the area with an indoor pool and the staff was very helpful wit the area! There is an on site restaurant with delicious food and very reasonable prices. It is very close to many attractions with a great price! Once again a great and economical stay. Staff is always friendly and helpful. We have stayed many times and will choose first for our future travel. We will continue to recommend the Best Western mountain lake to our friends and family. Great Place for the Money! It's not the ritz but it's clean and the staff is friendly. Ask for the first floor if you don't want to carry your luggage up stairs. They'll do their best. No elevator. What is nice you have a Microwave and small Frig. in rooms for long term and short guests. 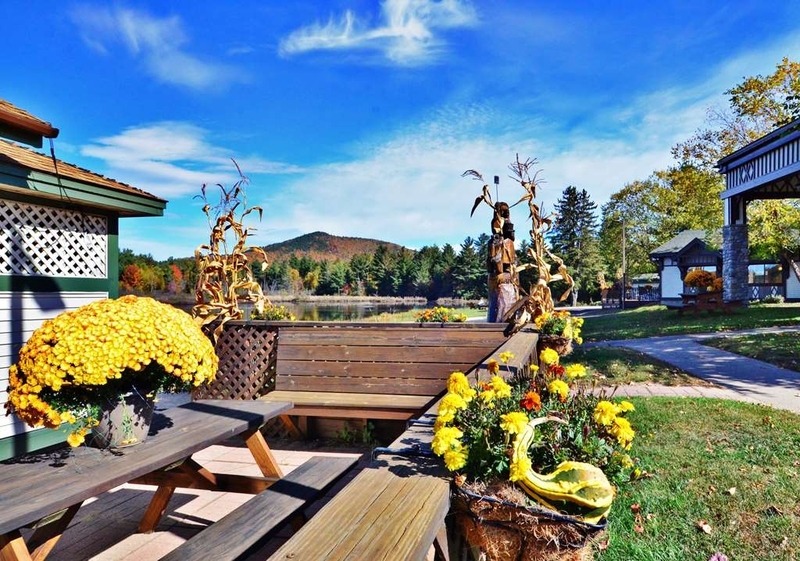 "Good price and close to Lake Placid"
My husband and I picked this hotel while traveling with our dog. This hotel was picked because they have a once per trip pet fee versus a pet fee per night. The staff here was really friendly. My husband had a great chat while checking in about the hikes in the area while I chatted with the housekeeper about dogs. One thing to note if you are traveling with pets is that you are only allowed to use one entrance to enter and exit the building with your pet. While we were there it looked like they were remodeling or freshening up some of the rooms. It didn't disturb us during our stay but it may be even nicer. I wish this hotel offered breakfast since during the off season the places to eat aren't so easy to find. I also wanted the bathroom to be updated. Because there is a curved shower curtain rod the door hits it and bounces back. Also the door, when opened, blocks the toilet and shower. I also wish the shower was cleaner. I found a couple of hairs that weren't mine or my husband's in it. This hotel was clean, the beds were comfy. The staff was friendly. There weren't any extra frills. the pool and pool area was decent. They should consider putting in a hot tub for adults and maybe a little arcade for kids. There wasn't a free breakfast that many hotels offer these days...but a nice diner is on the premises. It offers breakfast and lunch. A few eateries to chose from in the area. The staff were great and so was the location. The room was clean but bathroom had slight odor. Only problem with my hotel was the bed. Mattress was thin and I kept sinking into the middle. I don't know if the other rooms had newer mattresses but I had difficulty sleeping and ended up tired on the 8 hour drive home. Stayed here two times this year for a total of 4 nights and loved it. Staff is great, rooms are clean and in working order. Recommend it highly. They were dealing with a broken water pipe on the street and were accommodating during that time. They had bottled water, fruit, and newspapers for the guests, and tried to keep us up-to-date. "Decent rooms, pool, close to great hiking"
Hadn't been to the area since my parents took me 15 years prior. Front desk staff was very helpful and extremely knowledgeable about the local mountains and weather conditions. Room was big and clean with a nice view of the pond outside. They also have wooden chairs down by the water where you can sit and watch the sunset. The indoor pool was a nice feature. Overall very happy with my stay. Stayed at the Mountain Lake Inn for a business trip to Lake Placid-- the location is super convenient and the staff was SO nice. The hotel itself is a little on the older side, not too fancy, but the homey atmosphere makes up for it. Restaurants, grocery store and convenience store are within easy walking distance, and the downtown area is just a little farther. 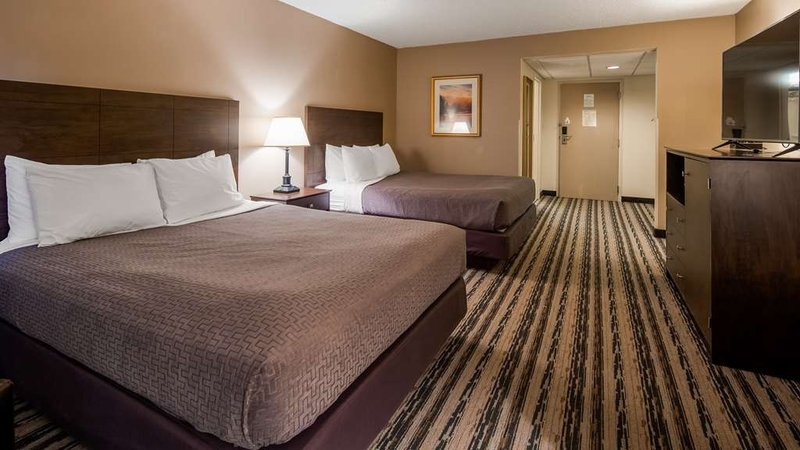 "A good night's sleep with breakfast and dinner restaurants in easy walking distance." We stayed at the Best Western Mountain Lake Inn for just one night, and found it very comfortable. A key advantage for us was that the hotel was able to recommend both a restaurant for dinner and a restaurant for breakfast that were both within easy walking distance. After driving all day and anticipating driving the next day, we really appreciated the opportunity to walk conveniently and not have to take our car out again. "Best Western Mountains and Lakes"
Hotel met all my requirements and had helpful friendly staff. All was as expected or better. Restaurant on premises was a plus. Plenty of parking and reasonably prices. Convenient location. Neat and clean inside and out. Food was good and reasonable too. Nice stay here in Saranac Lake in August 2015. Stayed for three nights. Area was crowded and there were plenty of kids at the hotel. No issues with noise. Rooms were plenty big and had fridge as well. Good location to walk to a few area restaurants and ice cream. Staff was friendly and helpful. Wish they served breakfast as part of the hotel package. There is a restaurant adjacent to the hotel but would love to see inclusion in the hotel price. "Friendly and clean; good location." Typical Best Western although the facade is a bit dressed up. Front desk was friendly. Room was clean. Plenty of parking and doorways surround so access is easy. Especially nice that lake is across the street. Liquor store and Mexican restaurant are also right there. Not much else within walking distance but a short drive. Breakfast is on property in a separate business that offers hotel guests 10% discount--servicable but rather charmless. Best Western always delivers as far as we are concerned! 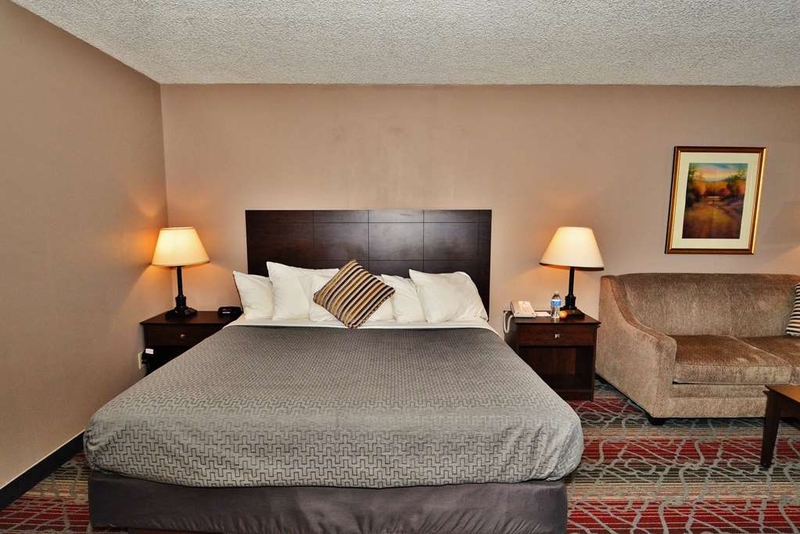 The rooms are clean, comfortable, quiet, and everything is in good working order! The staff are pleasant, helpful, professional, and often recommend a great local entertainment not otherwise to be discovered! Thanks BW! Very helpful, good directions, knew the area well. Were able to help us navigate to the hotel when we were lost. Knew all the attractions in the area. Room was great,as was the bed. Staff were outstanding! Pleasantly surprised at the quality of the room, bed and the cleanliness. Would stay there again for a longer period of time. Desk personnel were pleasant, courteous and thoughtful. My service dog was welcomed and that wasn't the case at the hotel across the street. "Great location, but needs updating"
This hotel has amazing views and is in a great location, but it's well worn and in need of an update. The bathroom is very tiny and the force of the shower was like needles. The shower head could not be adjusted at all and the shower curtain seemed to gain a life of its own, wrapping around me and creating a wet mess on the floor. It was difficult to maintain a constant temperature in the room and the air had a very musty smell. Disappointing that there is no elevator or staff to assist with luggage. I've stayed a many Best Western properties and this one is not up to par. Not sure how the other lodging offerings compare, but will likely check those out or drive the extra miles to Placid for another chain hotel. "Overpriced bog standard motel accommodation"
We stayed here on a Saturday night. On the plus side the room was quiet and clean but the carpets were frayed, the room was very dark and dingy and generally the property was tired and dated. Very poor value for money. The indoor pool was a big plus and not something that we could find elsewhere in the area. Easy,short drive to Lake Placid. One downside was that that breakfast was not included, but the hotel provided vouchers for 10% off at a next-door restaurant. There were a few restaurants within easy walking distance.